As a preservation carpenter and joiner my work regularly requires me to work work with a wide variety of cut nails. 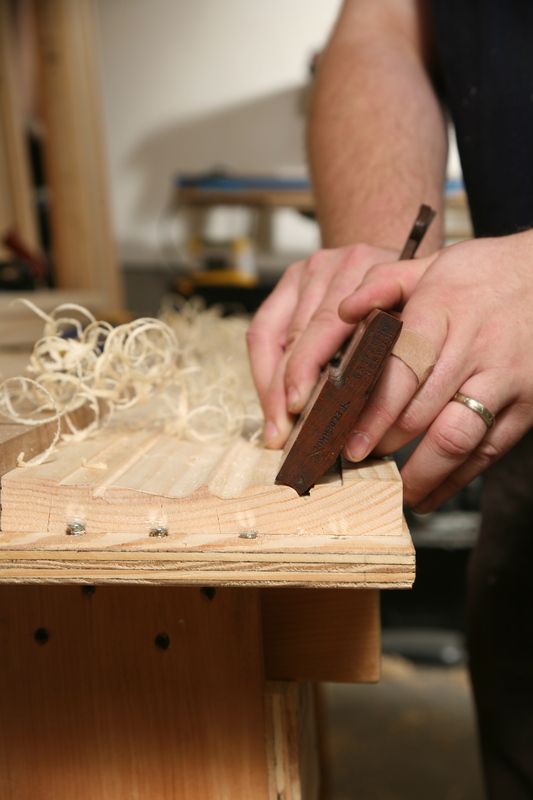 A lot of recent woodworking publications focus on cut nails appropriate for cabinetmaking and smaller projects, but that barely scratches the surface of what was still available if you know what you want and where to look. 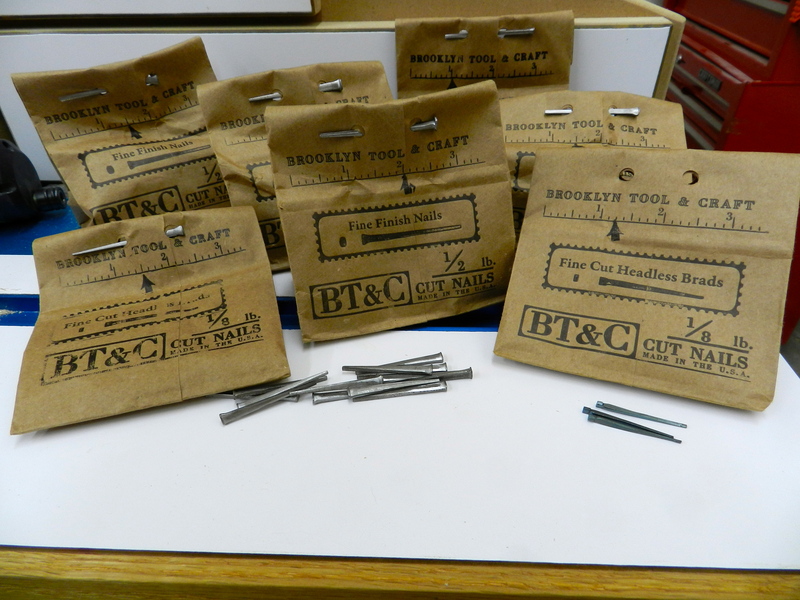 You can still get cut nails, even galvanized steel cut nails from Tremont, the oldest remaining and most prolific cut nail maker that is still around. Why do I want to use cut nails? All that sounds well and good, but is it worth the extra time and expense to track down these sometimes hard to find nails? To high style door pediments and architectural details.. The cut nails add to the visual authenticity and given their superior holding abilities will also increase the longevity of the work. 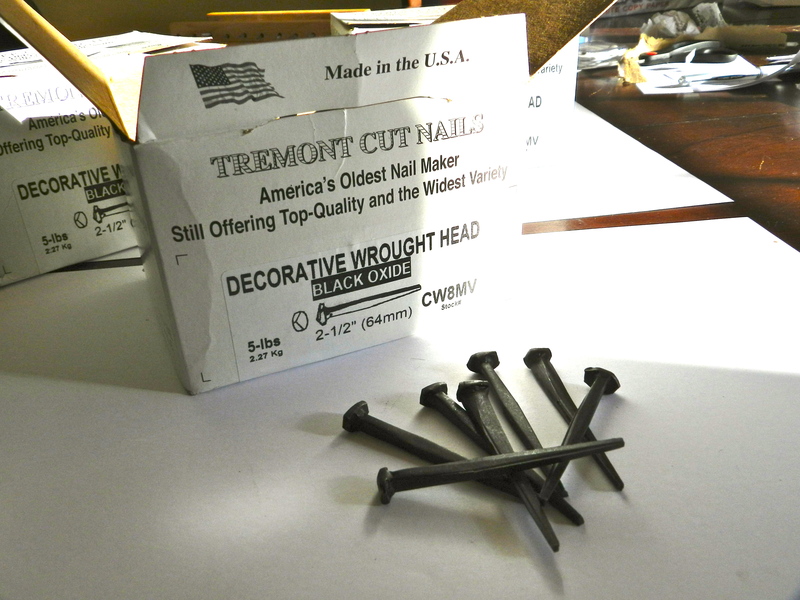 If using the nails on an exterior application consider buying galvanized cut nails. If your local supplier does not offer that, you can send the nails out to have them hot dipped for a reasonable price. This will help the nails survive the elements and require less maintenance. Where can I find these cut nails? 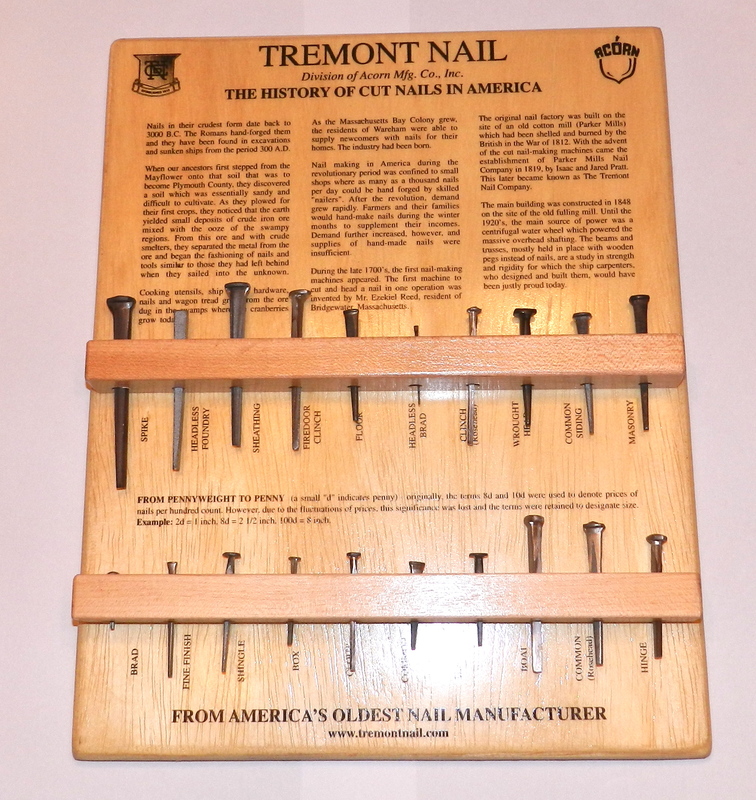 The Tremont Nail wood board with sample nails is available for purchase from Tremont — it’s a great addition to any shop and allow folks to examine each of the above described nail types in person. I have one in my shop and have found it to be a nice visual aid in my teaching. I hope to see more folks using cut nails on their projects. Most people relax on their summer vacation. After a day on a beach I get antsy and need to keep moving, exploring and building. For the second year in a row I spent my vacation last week sharing my passion for the craft by teaching the 8 day intensive that is part of the semester long ‘Traditional Building’ class I teach at the Boston Architectural College (BAC) in association with the North Bennett Street School. 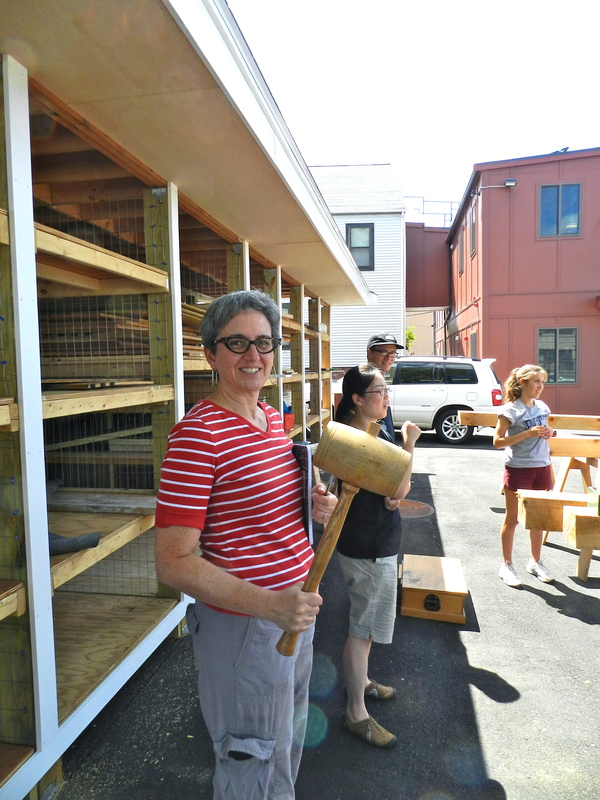 The class is part of the low residency Master’s Degree in Historic Preservation at the BAC. In this 8 week long class, 7 weeks are online with a series of interactive lectures/discussions and traditional coursework and one 8 day week is spent with the entire class in Boston participating in a hands on format. This works great for students who need to juggle work, family and other obligations while also seeking a quality degree on the way to a new or expanded career path. 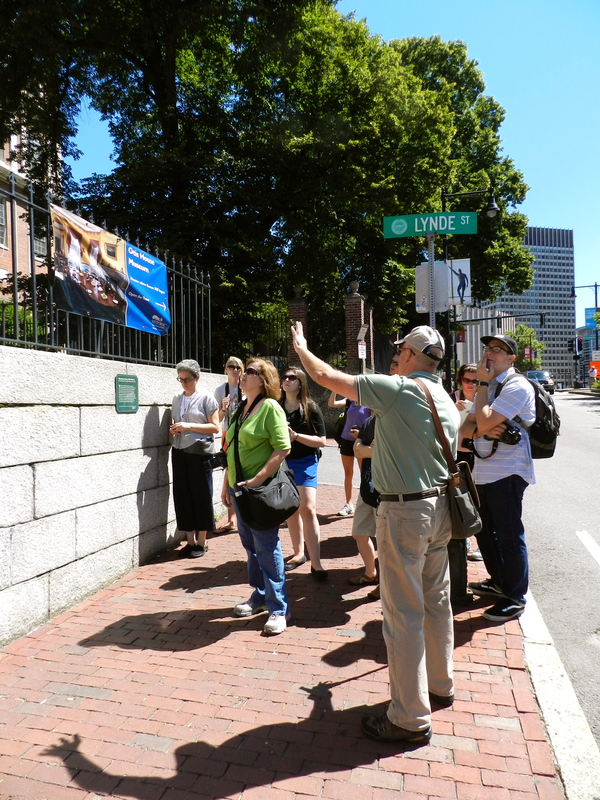 On the first full day of class we took a walking tour of the city with Steve O’Shaughnessy (NBSS Preservation Carpentry Instructor) visiting several historic house museums and notable structures in Boston. 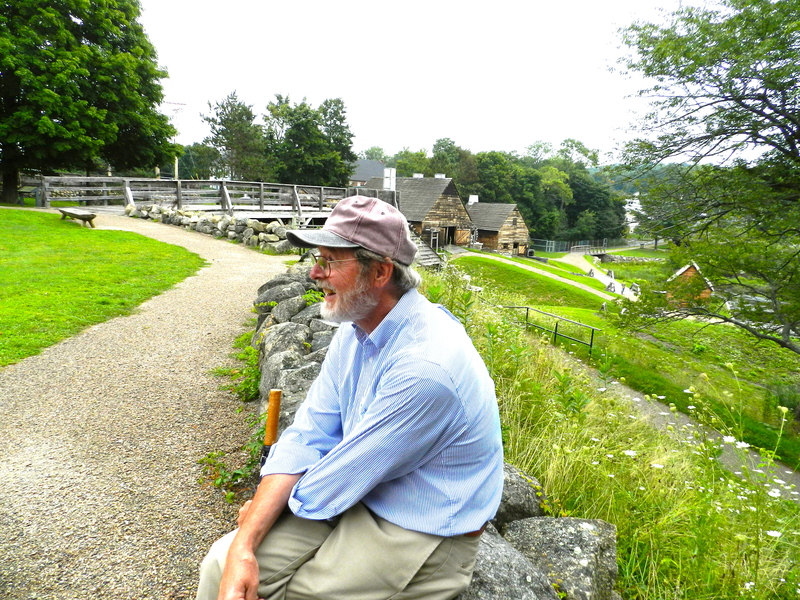 Having worked for Historic New England, Steve is an excellent tour guide with a lot of great information to share. The second day I spent the morning teaching the basics of traditional woodworking — using a smoothing plane, molding planes, drilling, chiseling and other basic bench work. 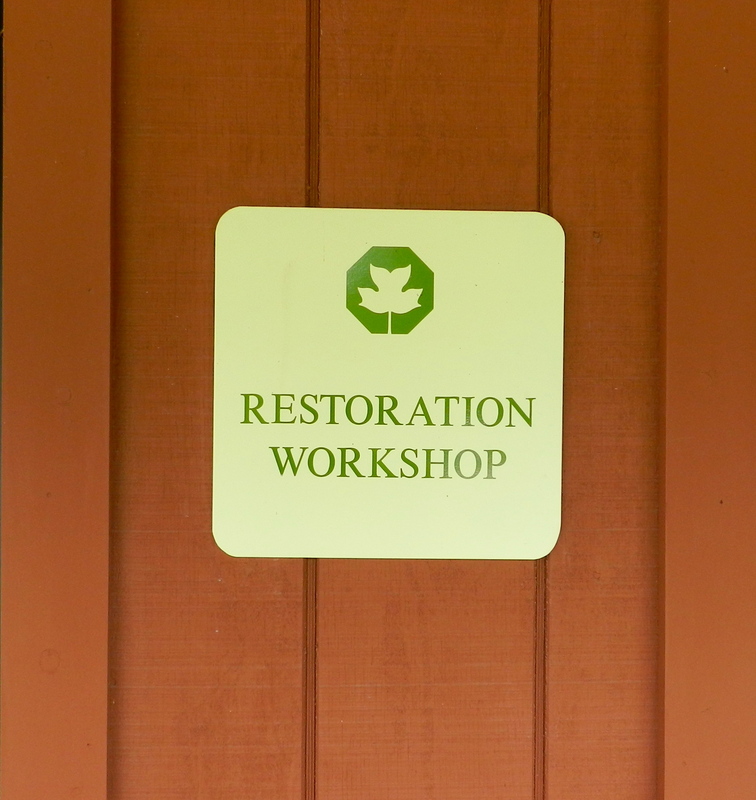 In the afternoon I taught the class about window restoration, window reproduction and condition assessment reports. 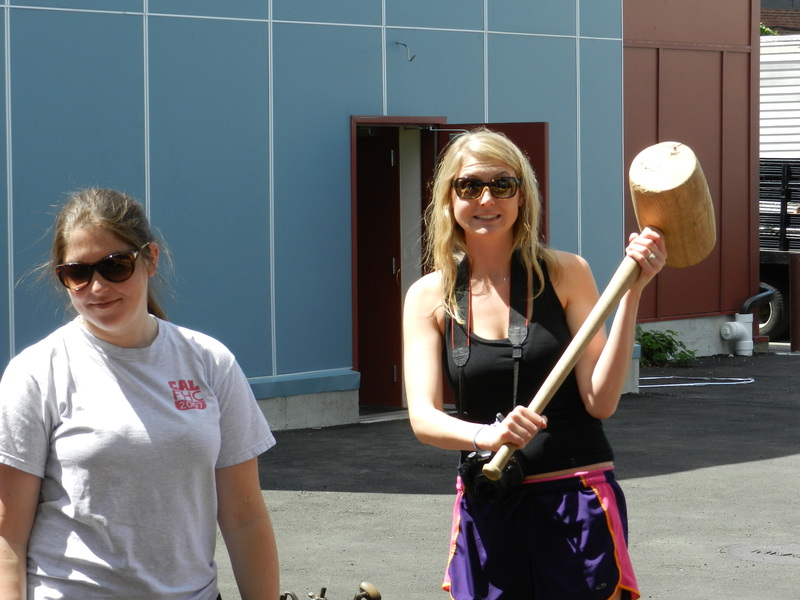 We then went out to do some field work at the historic Fenway Studios. Robert Adam (Who started the Preservation Carpentry program at NBSS and is a noted preservation consultant) lectured about historic hardware and fasteners. 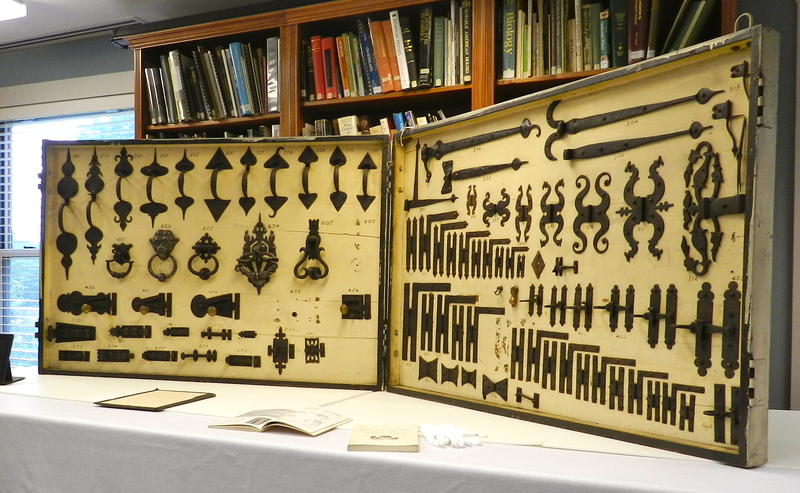 Robert’s brings a portion of his comprehensive collection of historic hardware and fasteners allowing students to closely examine these items up close and differentiate fine details. 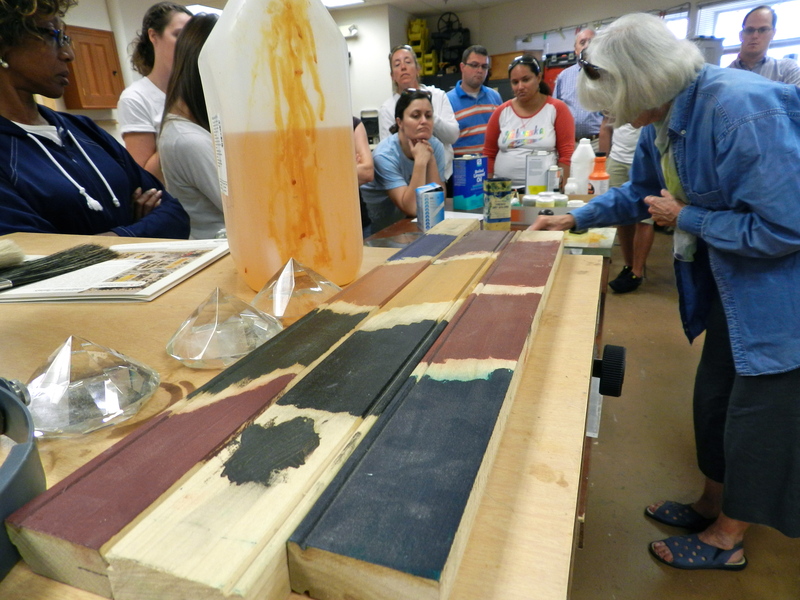 Sara Chase, a nationally known paint analysis expert and preservation consultant (+ advisor to the NBSS Preservation Carpentry Program) taught a session on traditional paints and their manufacture. 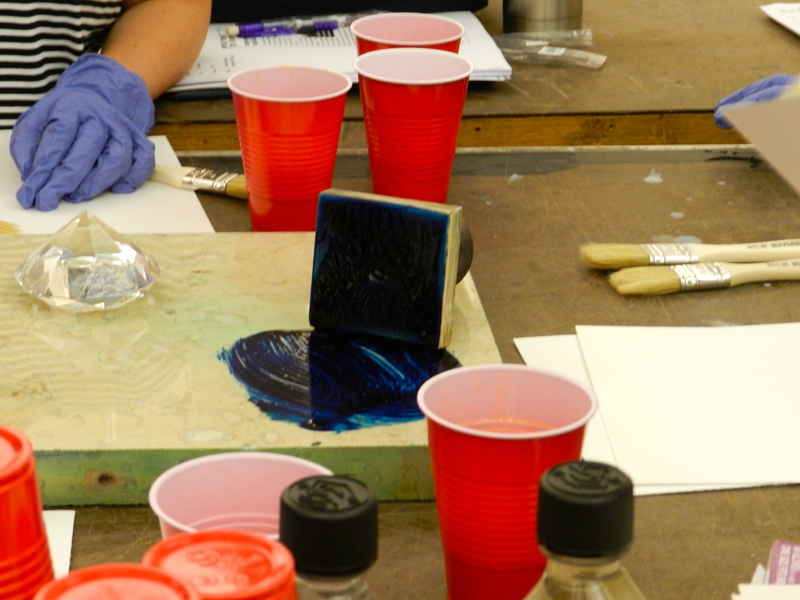 During this hands on session students not only learned how to identify various kinds of historic paints they also had the chance to mix their own paints in a traditional way and try their hand at applying them. 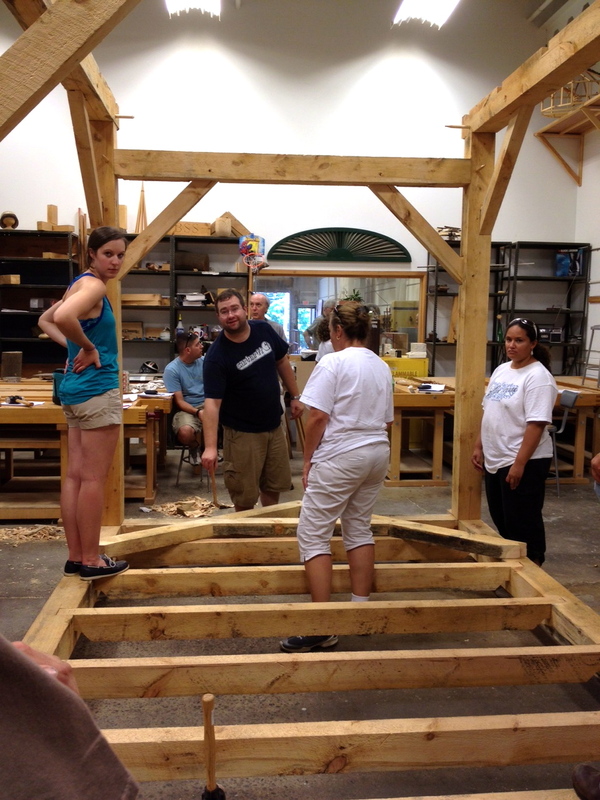 After a visit to the MFA in Boston, next up was NBSS Preservation Carpentry Instructor Rich Friberg to teach the basics of Timber Framing. 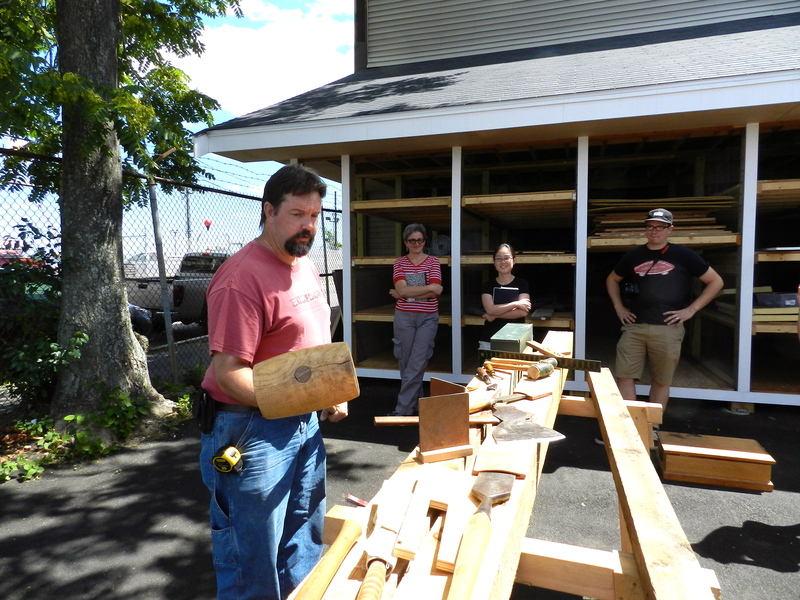 Rich brings with him a deep well of knowledge and a passion for teaching this craft. 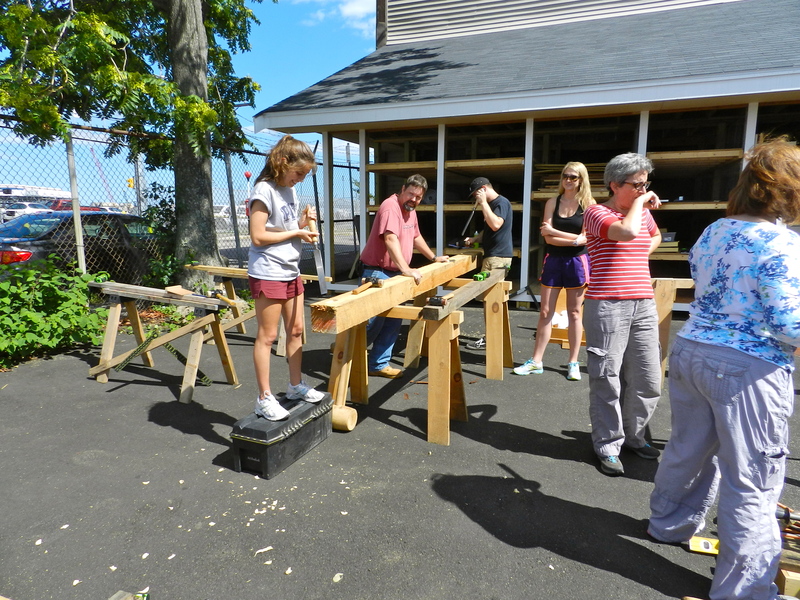 Students had a chance to layout and cut mortise and tenon joints…. 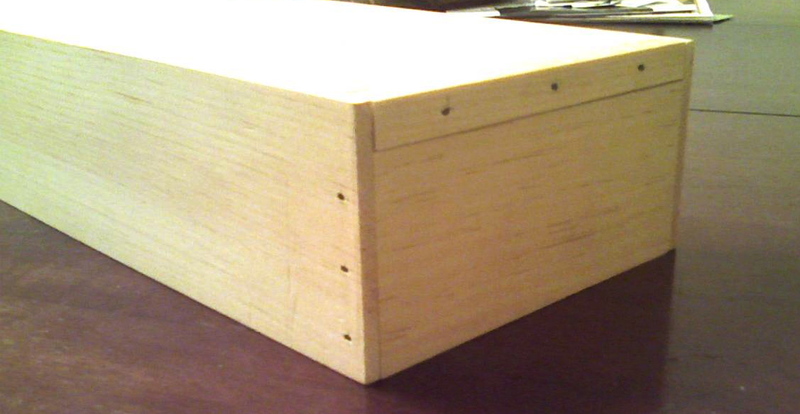 and fit the joints they made. 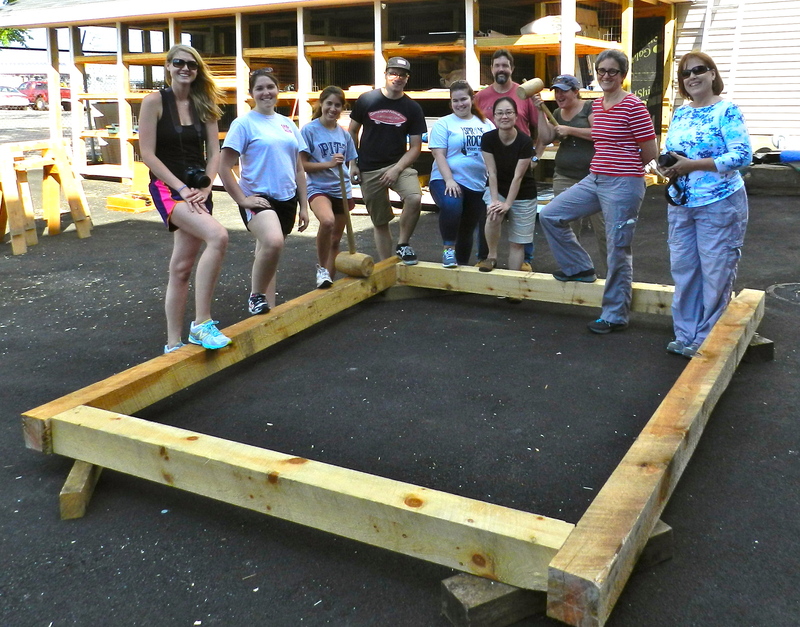 The completed 8′ x 10′ sill shown above would be the first major element of a modest sized barn or outbuilding. Preservation Mason Matt Gillard (owner of Colonial Brick Works) and Matt Blanchette gave a great lecture on traditional masonry tools, techniques and evolution. 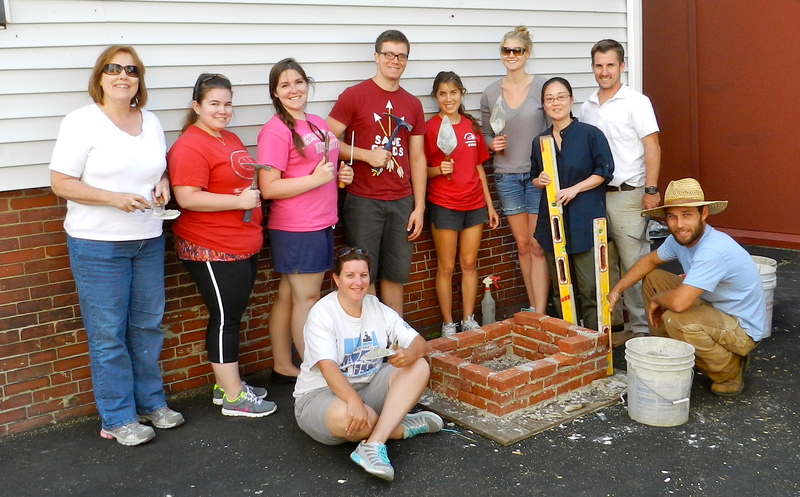 This hands on session allowed students to mix traditional mortar, clean bricks, re-point, repair, lay brick and joint mortar. 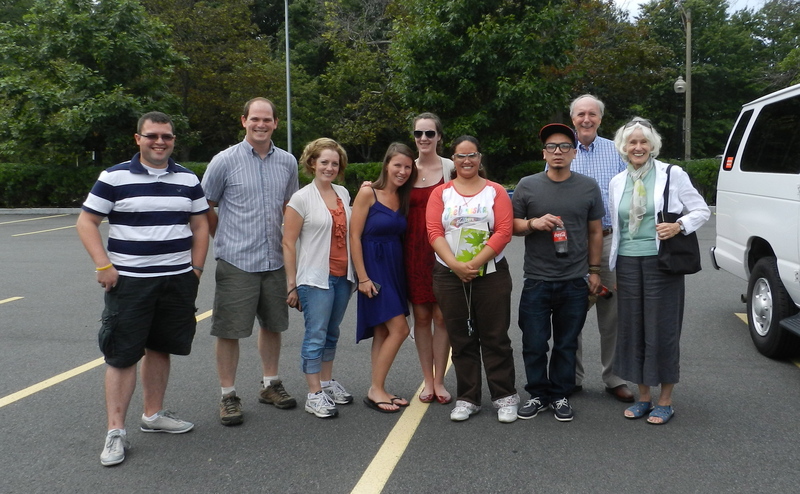 At the end of the week the students also shared their presentations and research proposals. 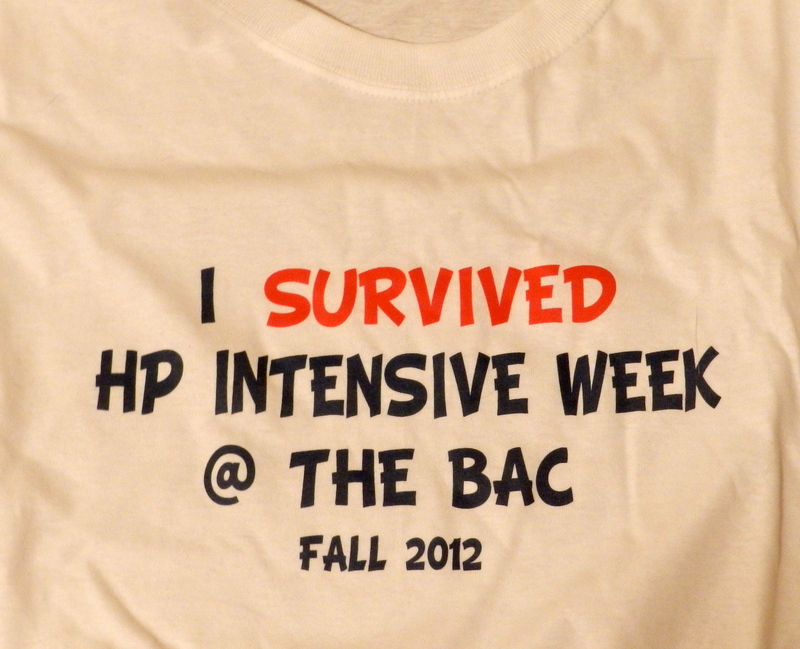 To celebrate the end of this very intensive week the Director of the Historic Preservation (HP) program Robert Ogle presented each student with an ‘I survived the HP intensive week 2013 @ the BAC’ Tee Shirt to commemorate the occasion. This well earned reward is one of three major intensives they will need to survive in order to complete the program. You can learn more about this class and the program here or go direct to the video here. Have you ever felt like your life was just too hectic? Do you want to get away from the world and relax? If so, then you can imagine how Thomas Jefferson felt as the 3rd President of the United States. Jefferson was a man who enjoyed his privacy. After decades of public service as a congressman, founding father, diplomat, Governor, Vice President and President, folks from around the world regularly called on him — including a seemingly never ending stream of gawkers and tourists peering in his windows. This made it hard for him to find peace and quiet to pursue his diverse set of interests and be alone with his family. 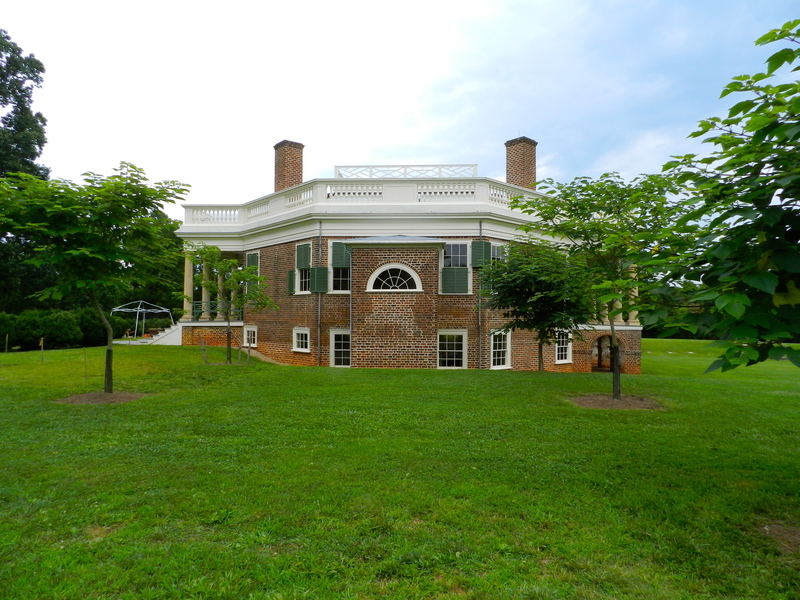 While President he found the time to design a retreat villa at Poplar Forest in what is now Forest VA. Based on the classical designs of European retreat villas and lessons learned from earlier architectural projects like Monticello and the University of Virginia, Poplar Forest is considered to be Jefferson’s apex in terms of design. 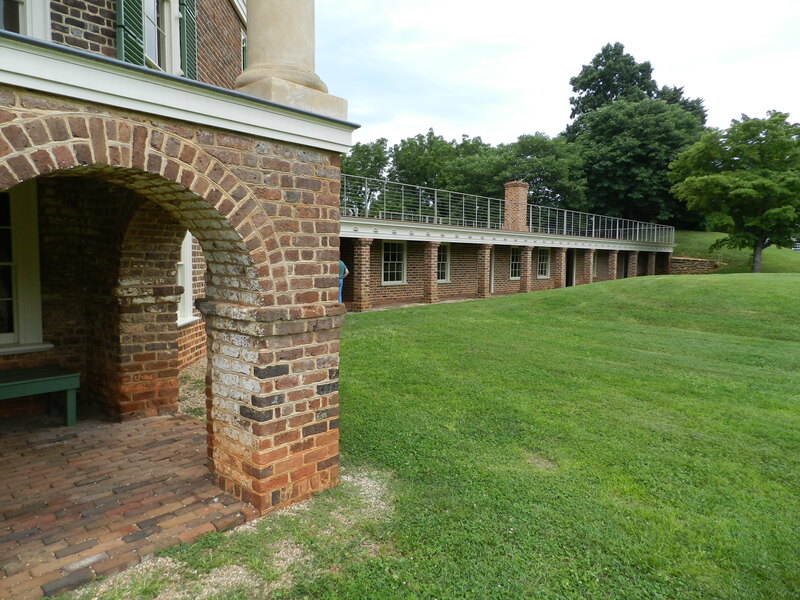 Jefferson enjoyed his time at Poplar Forest during the last 20 years of his life where he was able to ‘seek the solitude of a hermit’. The drive up to the mansion gives you a taste of how secluded this house was designed to be, though for the lucky few who visited, that first glimpse of the house at it appeared ahead of them must have been breathtaking. The house also gives an interesting look into the private life of this very public figure. 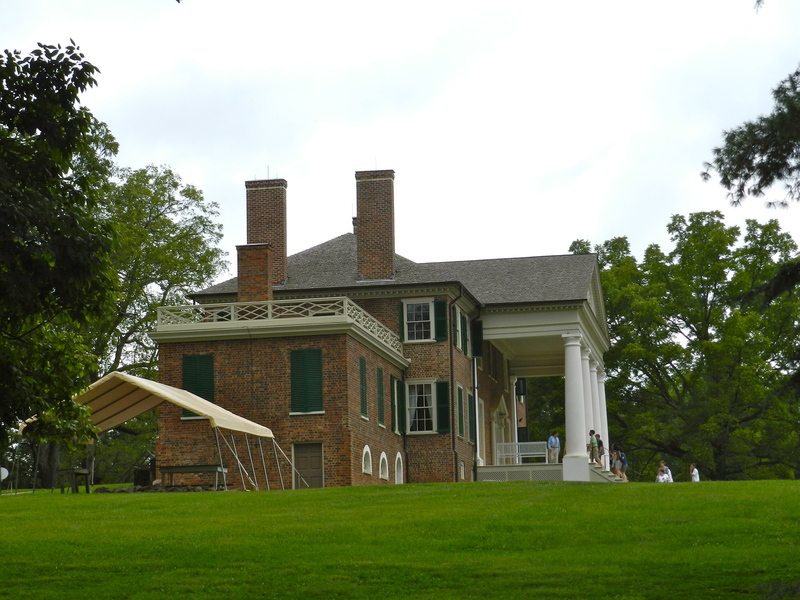 During Jefferson’s time the house was largely unknown to the outside world. After his death the house and a portion of the lands were left to his grandson Francis W. Eppes who lived their briefly before moving on to Florida where he went on to a successful political career. Given its semi-remote location, and the fact that the house did not function well as a more modern house much of it has survived and is now a museum. 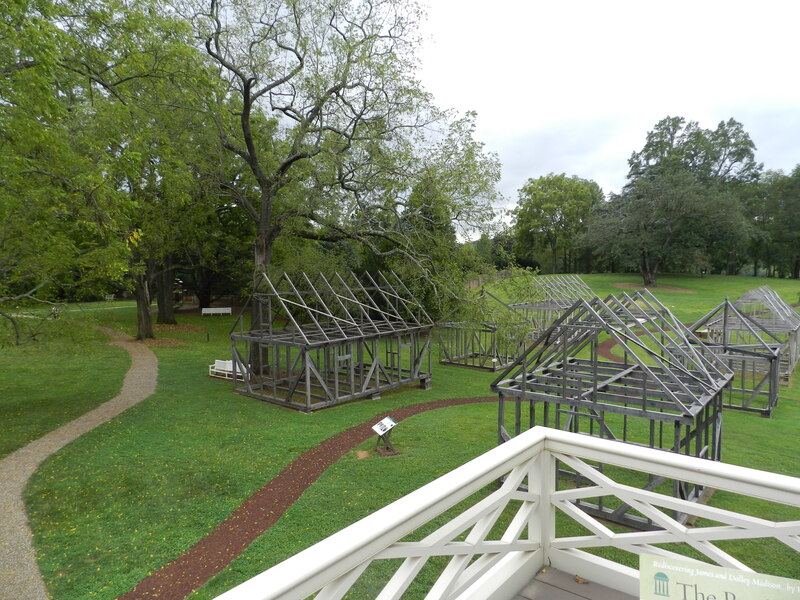 The museum and the non profit foundation that backs it have been working on restoring the house to how it looked at the end of Jefferson’s time there. Fire, later owners and weather have all taken their toll over the years, but the craftsmen and scholars who work on it have been doing an excellent job of bringing the house back to its earlier grandeur. With each visit there is always something new to see. 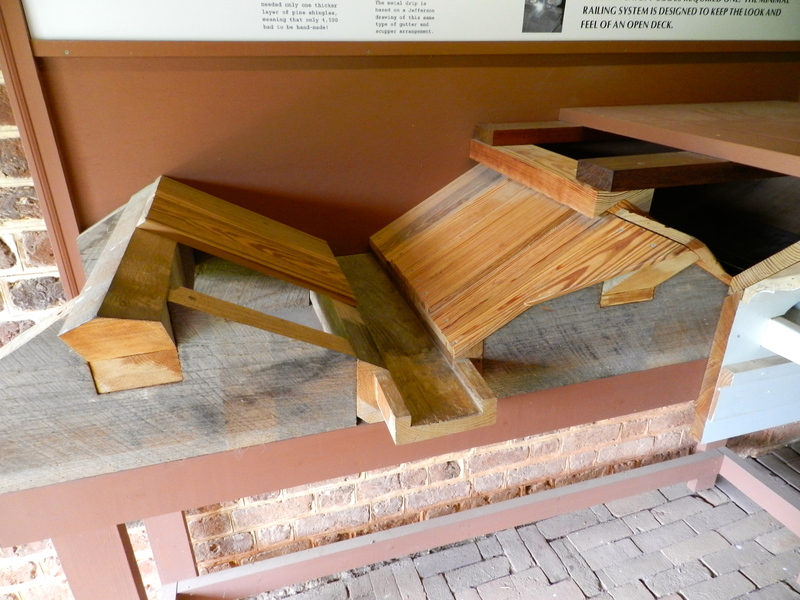 Model of the Jefferson designed flat roof structure above the wing of ‘Offices’ that funneled water away from the roof and allowed folks to walk on the roof. 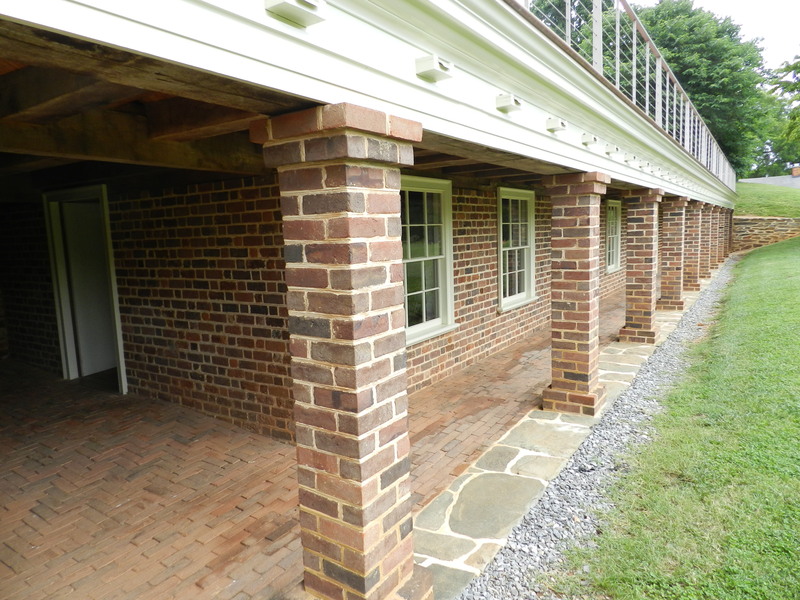 Jefferson loved the idea of having a flat decked roof that one could stroll out onto and refined the details of how to accomplish this several times over the years with varying degrees of sucess. 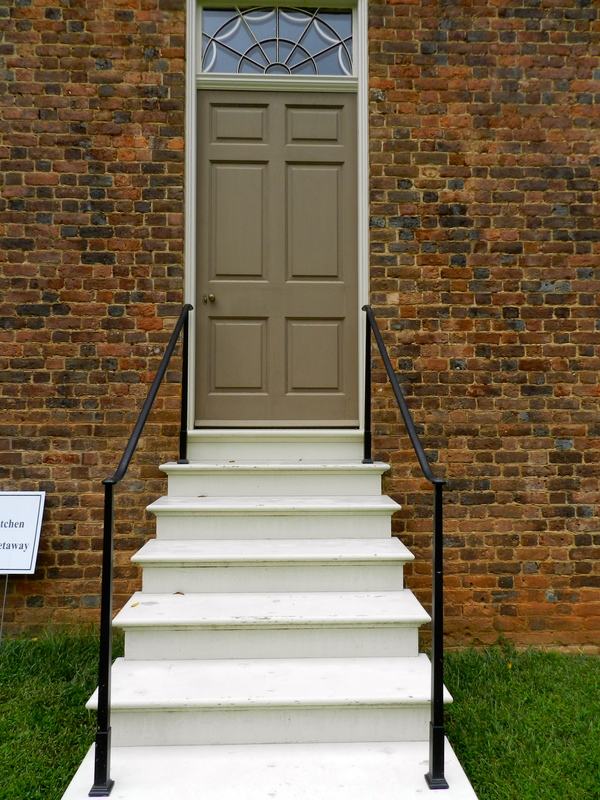 You can see other examples of how he attempted this at Monticello and Montpelier. The model above shows how the decking sat atop a series of small ridges that were shingles and funneled water out to a series of spouts you can see in the photo below. It will be interesting to see how well it ages. This wing of ‘offices’ as they were called were designed to house the kitchen, store room, laundry and smoke house all of which served the main house. 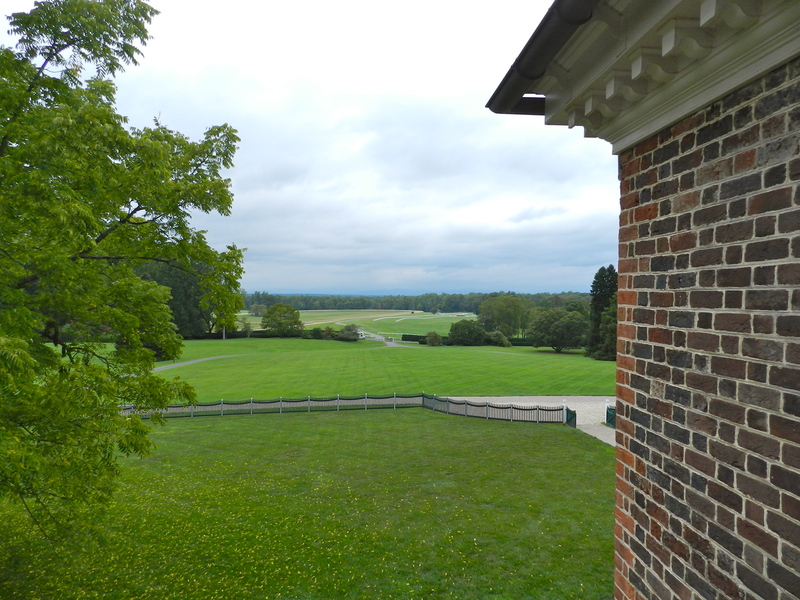 It also hid the logistics from Jefferson and his guests — he could stroll out on top of this wing and not see the busy servants going about their business below. Beyond the building architecture and historical connections, the home is also notable for its stunning landscape design. From the front of the house the wing of ‘offices’ is barely visible. A combination of trees, mounds, bushes, and other natural elements allowed the house to project a sense of symmetry and scale that made it look like a grand European retreat Villa. Over the years Jefferson continued to refine his vision and expand the site even in the face of mounting debts. 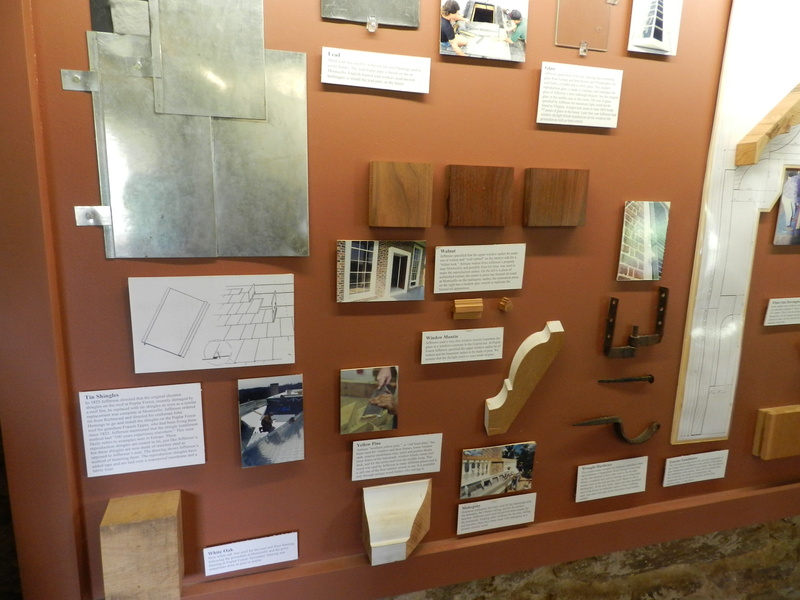 A nice display showing some of the restoration efforts that have been going into the site. In the basement of the main house is a series of displays that describe the painstaking process the restoration craftsmen have been going through to restore the house over the past 20+ years. 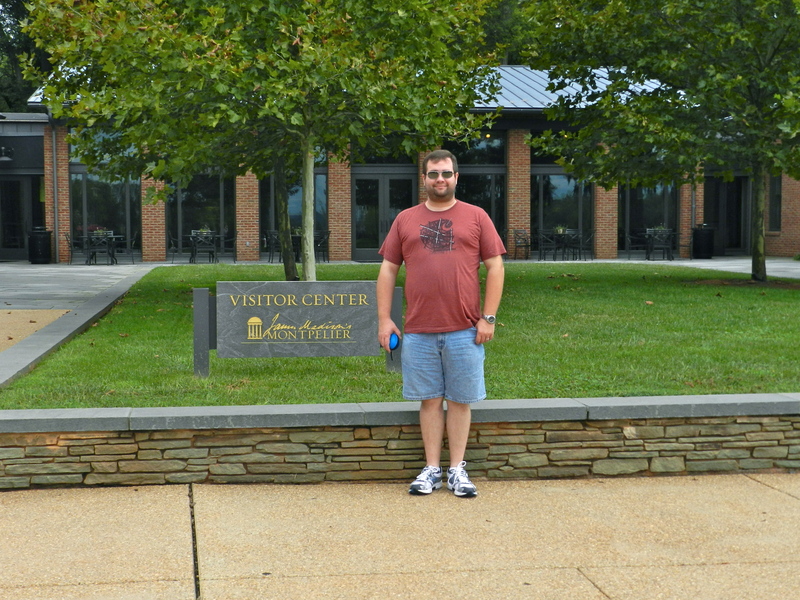 I had a great time hanging out with my friend David Clauss who is a Senior Restoration Craftsman for Poplar Forest. Much like Montpelier I love visiting Poplar Forest since much of the restoration work was done recently and is ongoing — so I feel right at home. 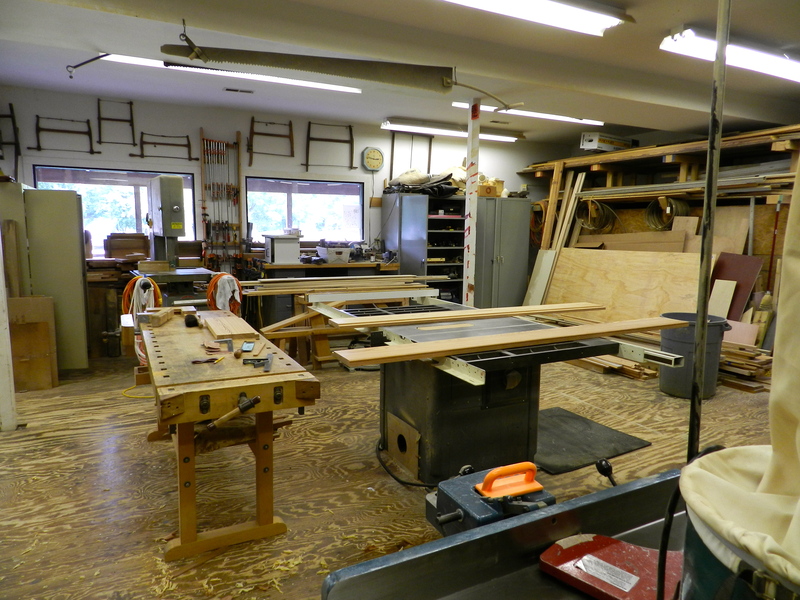 Dave was kind enough to also show me around the restoration workshop which is well equipped. Using traditional tools and materials, and the occasional time saving of some power equipment the craftsmen have restored many aspects of the house — from window sash and doors to the massive skylight in the central room and elaborate moldings. 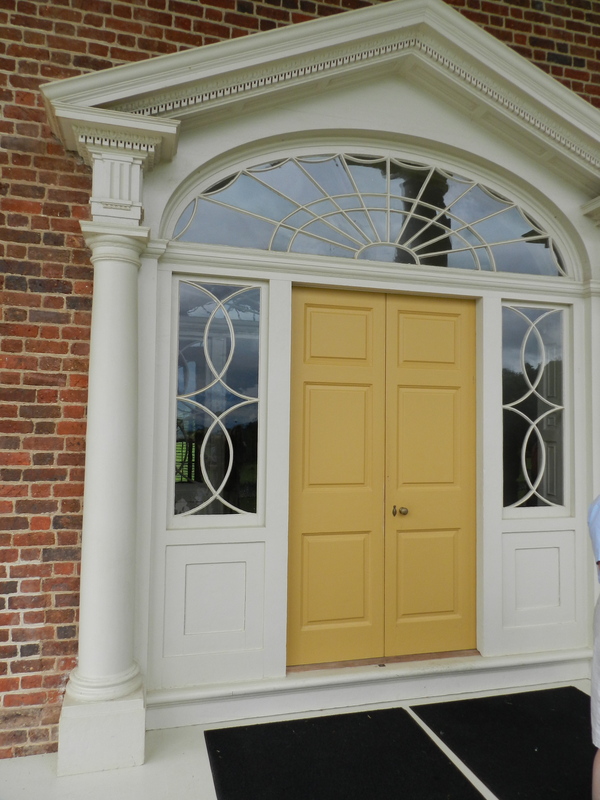 If you’d like to learn more about Poplar Forest you can watch a recent episode of the Woodwright’s Shop where Roy visited Poplar Forest here. 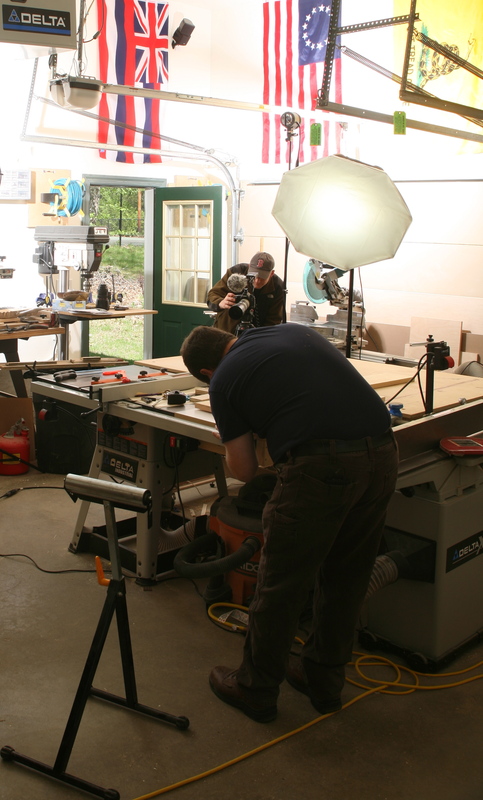 I’m happy to report that the companion video series for my recent Fine Homebuilding article ‘Master Carpenter: Reproducing Traditional Moldings’ went online today. I had a great time making the videos and I hope you will enjoy watching them. Several of them are free, though a few of them are reserved for FineHomebuilding.com (FHB) members only. 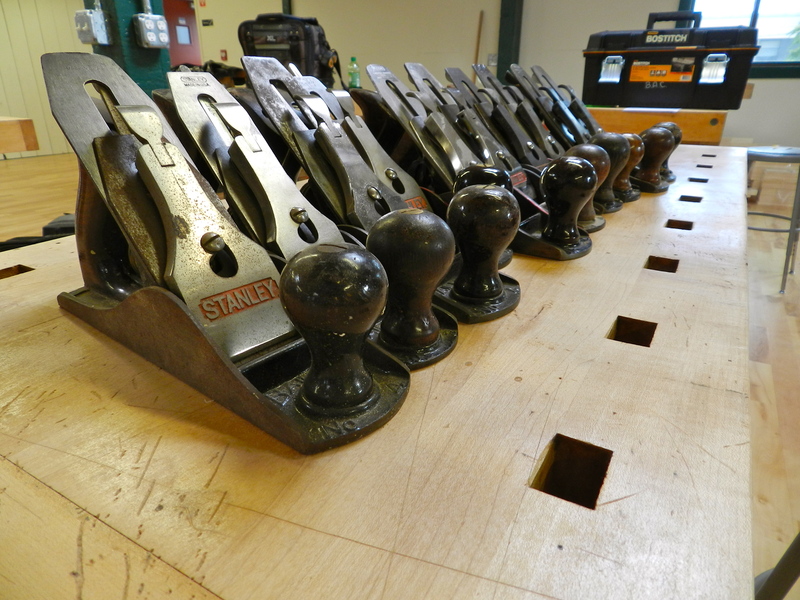 In this Master Carpenter series, Bill Rainford shows how to get period details right with both power and hand tools. Sign in as a member or sign up for a FREE 14-day trial to see this complete series and much more. The Alvah Kittredge House in Roxbury Massachusetts is a great example of high style Greek Revival architecture in Boston and a tangible link to the city and the nation’s early history. 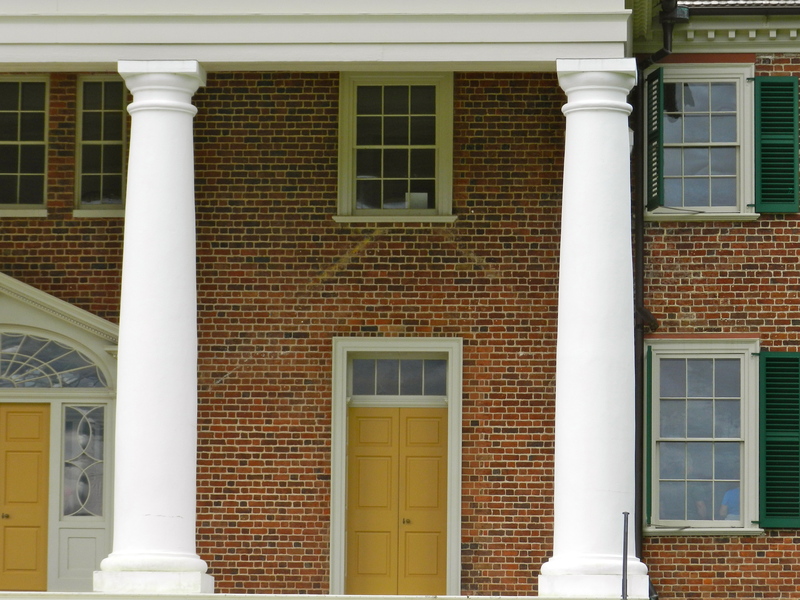 The Greek Revival Style was most popular in the United States during the second quarter of the 19th century. (Approximately 1820-1850) During this time period the population and economy was also growing by leaps and bounds. The United States was still a young nation and many folks wanted to show off their new found affluence. During this period of great optimism there was a strong belief in the American Democracy and many associated the ideals of the new nation with those of early Greek Democracy. Around this time, access to Greece and the designs of antiquity were also coming into the mainstream as influential citizens like Thomas Jefferson read books like ‘The Antiquities of Athens‘, Benjamin Latrobe and others built out Hellenistic monuments and public buildings in Washington D.C. and other large east coast cities, and builder’s guides like Asher Benjamin’s ‘The Practical House Carpenter’ proliferated the tool chests of local joiners and carpenters. Given this atmosphere many folks wanted to have their own building look like a Greek temple. 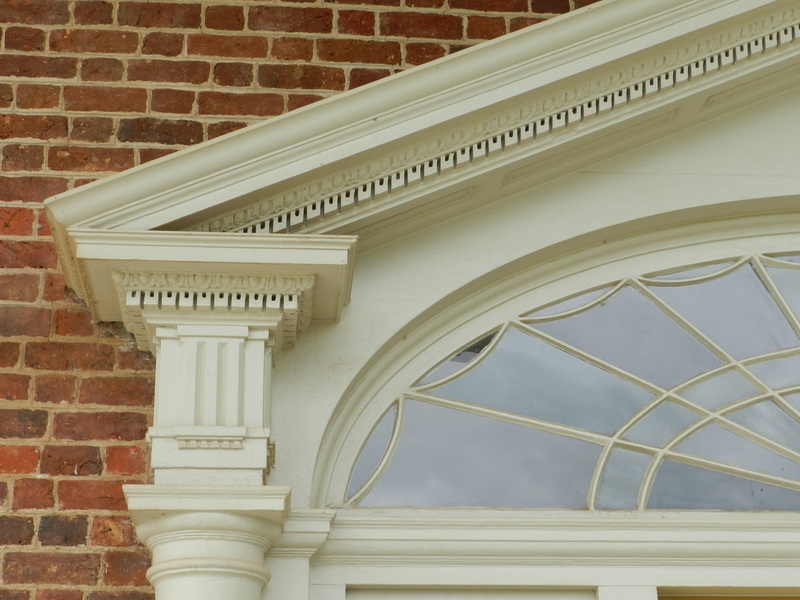 For most of the ‘middling’ Americans, especially those in more rural and western locales the scale and details would be simplified down to keeping classical proportions and greatly simplifying details to meet their budgets — pilasters instead of columns, simplified moldings or even flat boards attempting to echo the pediment and other design elements of a Greek temple. 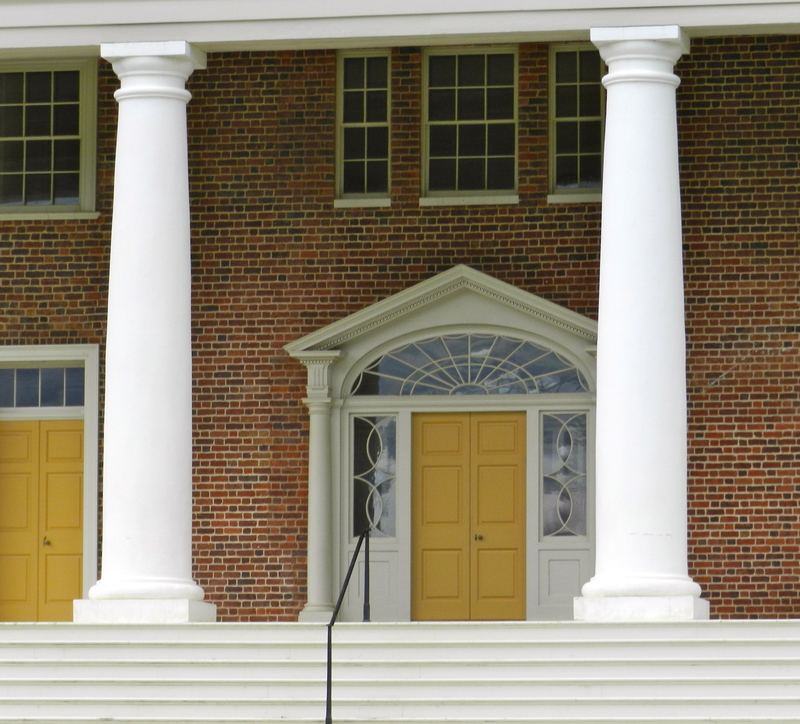 In places with money — like public buildings and mansions — the builders could afford to go big with design elements like a colonnaded portico and carved relief details in the pediment etc. 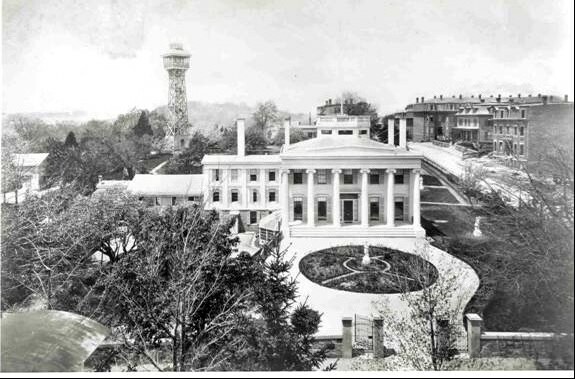 The Alvah Kittredge house is a great example of a high style Greek revival home which reflected the wealth of its original owner, and of Boston and the US in general at that time. Not only is the house unusual given how the city has grown up around this once grand country estate, but the scale of the front facade needs to be seen in person to be properly appreciated. The two story portico with its double hung windows and high ceilings required wide and detailed moldings in order to be the appropriate scale for such a magnificent home. 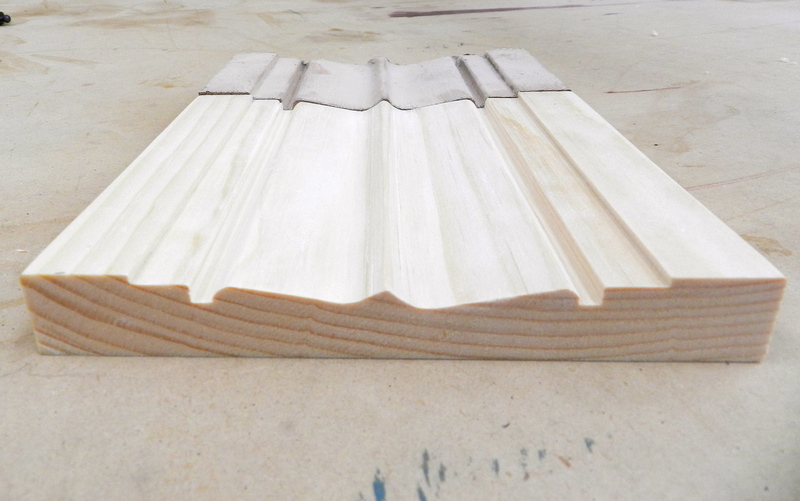 This 8 inch wide molding was made by hand using traditional wooden molding planes likely on site and from eastern white pine. This is not the sort of thing you can buy at a local big box store, or millworks supply company. 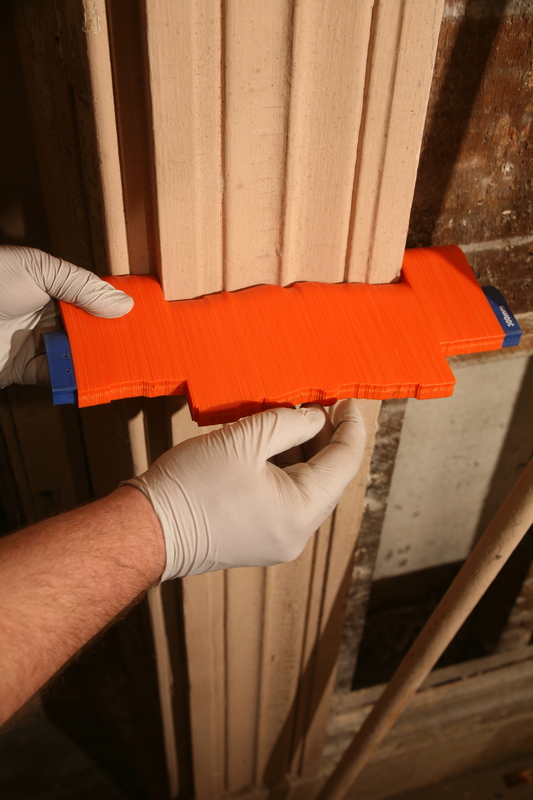 The best way to replicate this sort of casing is to make it from the same materials and in the same manner as the original joiner…. I started by capturing the molding profile via molding comb or profile gauge which aids in transferring the profile to the newly prepared stock. Many of these planes I use date back to the time period when the Kittredge house was actually built and yields results that simply cannot be duplicated by machine. The original handwork had variations and facets which catch the light differently when compared to stock that is milled by a machine. 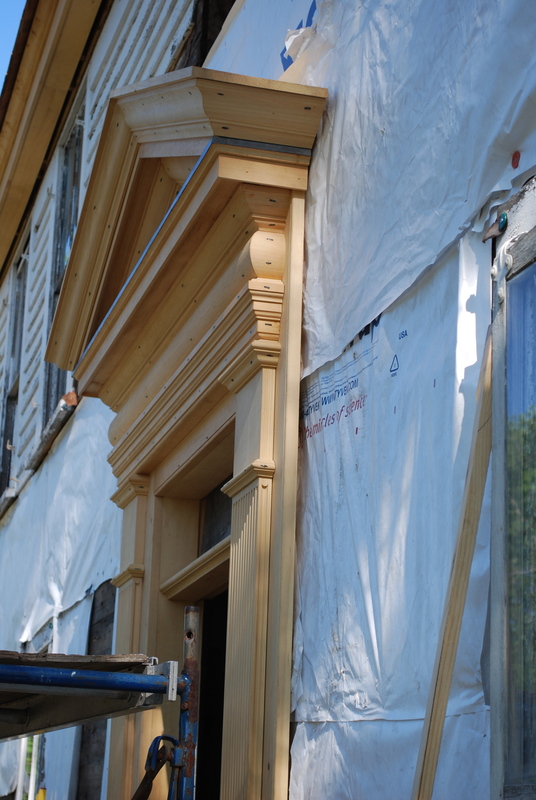 The end result is a near identical match that will help insure that future generations living in the Kittredge house will be able to enjoy it’s many details in much the same way as Alvah did when the house was first built. P.S. The above post was written for my friends at Historic Boston Inc here. 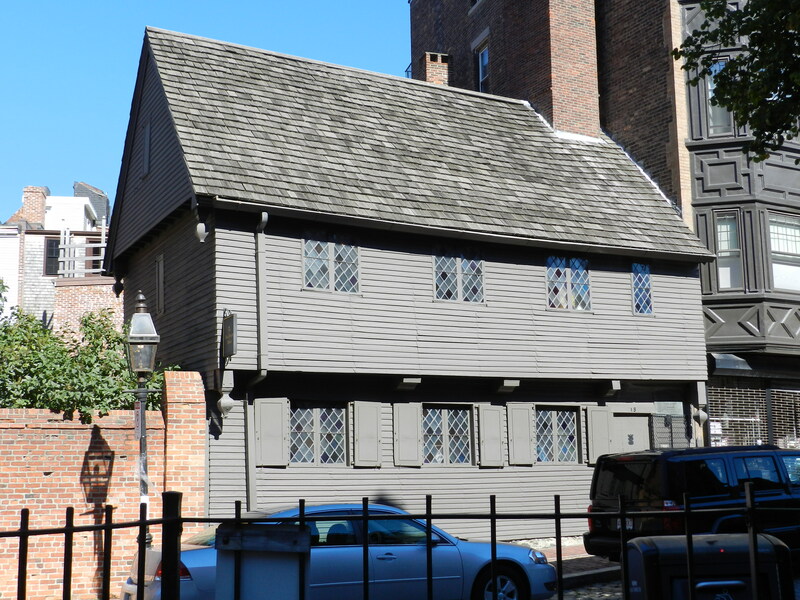 You can learn more about Historic Boston and specifically about the Alvah Kittredge House here. The historic Wellington House in Waltham MA dates back to the late 1700s and has a long history which was almost lost to development. 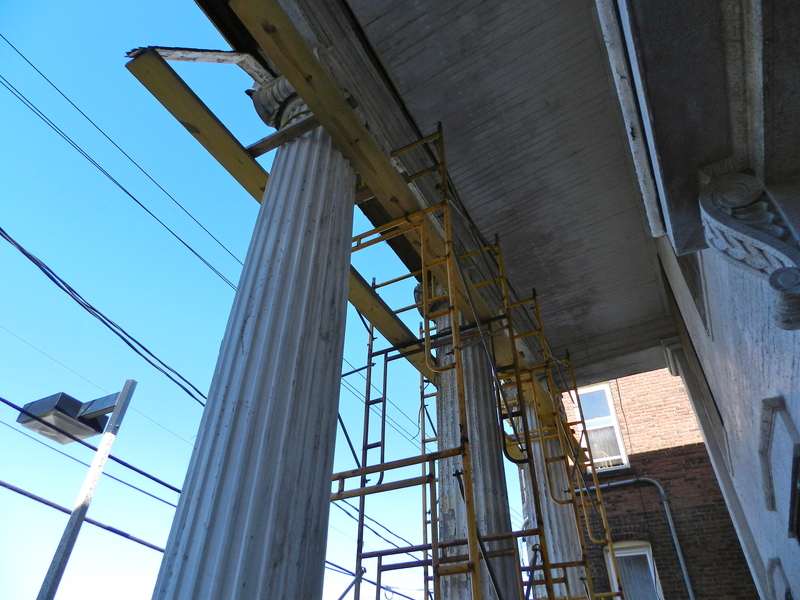 In recent years this house has seen some exterior restoration, but now things are progressing on the interior as well. 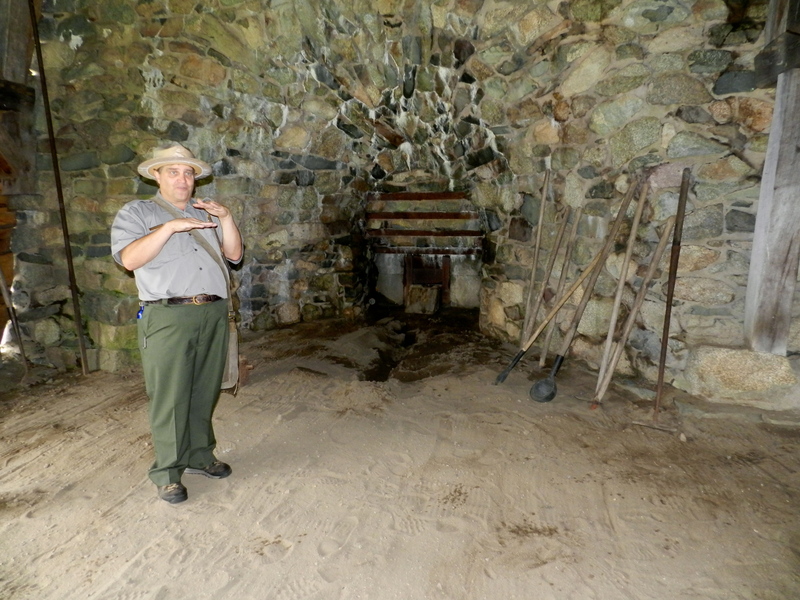 This post is the tale of how the kitchen fireplace surround was documented and restored. This house is an interesting specimen of Massachusetts Architecture from the time of the revolutionary war, the local militia and the large percentage of original details that remain intact in the house, though many of them are in desperate need of preservation. In 1989 the house was put on the National Historic Register of Historic Places. As a developer was looking to develop the acreage behind this historic property the city of Waltham had the foresight to ask that this house be donated back to the town along with funds to cover the restoration work. Since that time the roof was replaced, some structural stabilization was carried out and much of the exterior has been touched up, but the interior is another story. Once restored this building will eventually serve as the offices for the historical commission. Above is what the kitchen looked like when I arrived at the house. Steve O’Shaughnessy and I examined what was left and worked to document the fireplace surround, paneling, cabinets, hardware etc via photographs and site notes. Water had been infiltrating the chimney stack and was causing a lot of damage to this woodwork — along with various small animals. The paneling on the right side was bowed several inches off the wall. 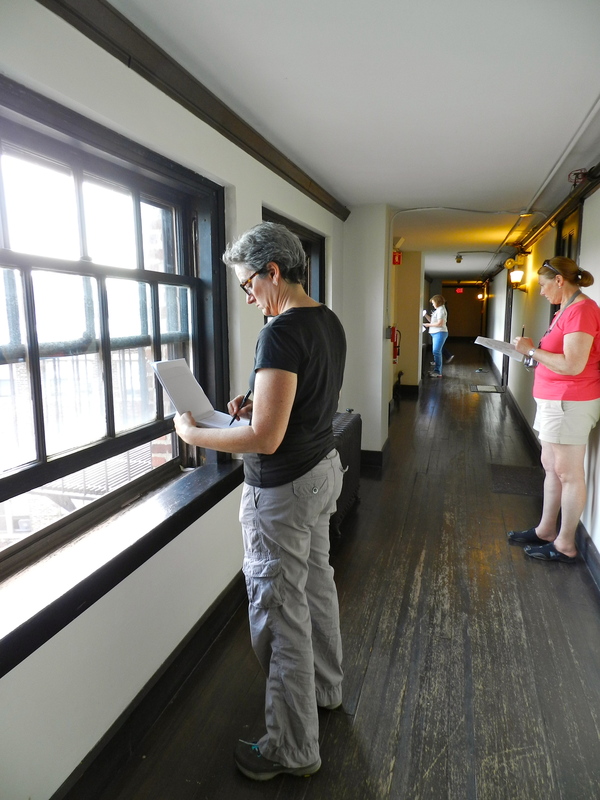 Sara Chase, NBSS adviser and paint analysis expert examined samples to determine the original color of the trim. 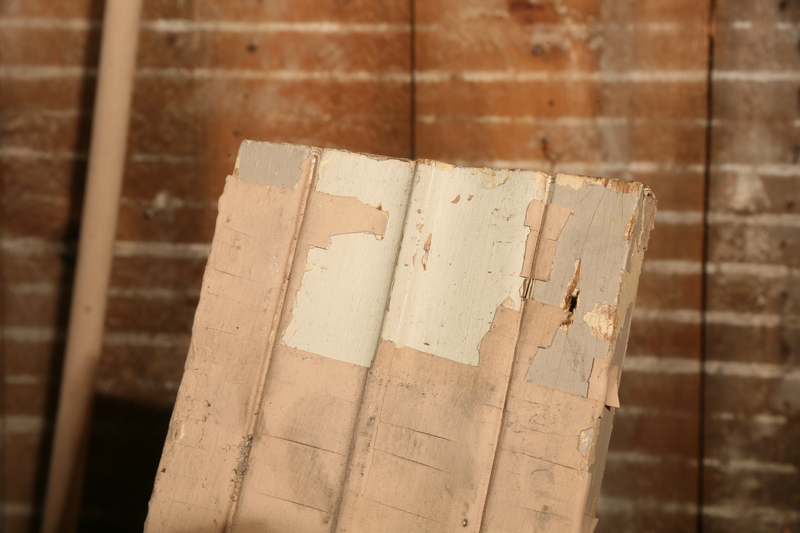 After initial documentation we carefully disassembled the paneling so the masonry could be examined and repaired and so the woodwork could also be restored. Getting the central panel out in a single piece was an accomplishment and while exhausted at the time we were happy that everything came out without breaking anything and it even revealed a nice surprise…. Behind the large panel was a large signature in fancy cursive writing that read: “Ernest S Farr January 28th 1904” I did some digging around on the internet and found that there was an Ernest S Farr (ca 1874-1920) in Middlesex who was married to Ida Farr and had a daughter named Helen N Farr in 1895. With the paneling removed you could see the masonry work of the chimney mass. You could see the heavy wood lintel was sagging a bit, but otherwise the masonry was largely intact. You could also see the scars of installing a stove into the main chimney flue and also into the flue for the beehive oven. It appears that the work of Ernest S Far was to replace the fielded panel and cover in the stovepipe hole in the primary fireplace, which leads me to think the stovepipe in the beehive oven was the later addition. I also have to comment that Ernest did a very good job getting that panel in place without disturbing the other woodworking — when we removed the rest of the surround we could see the cut nail holes and the rest of the paneling were original to the first installation. 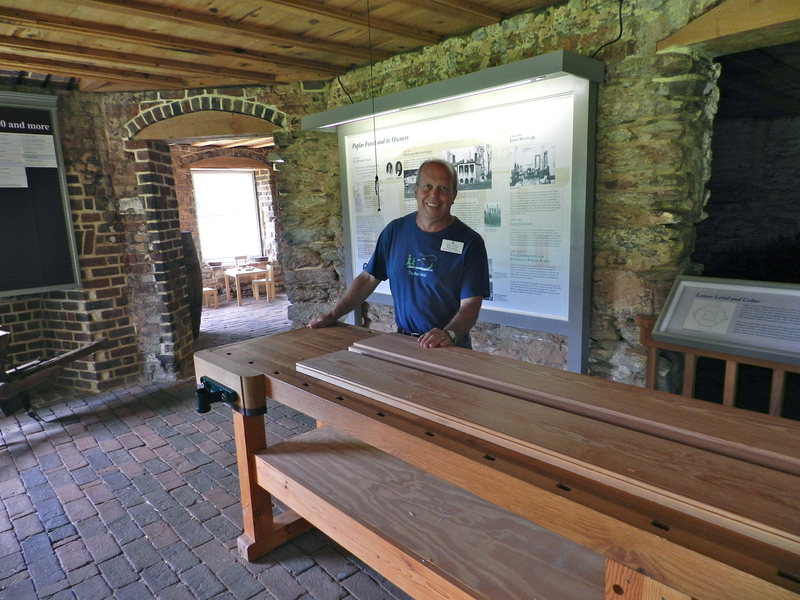 My friend and colleague Martin Hickman (also from NBSS) restored the woodworking that was removed. This was a laborious task that took many days to complete. Martin’s efforts paid off well as the final product once re-installed would likely have looked very familiar to the original Wellington’s who once inhabited this house. This room will eventually be used as a conference room for the Waltham Historical Commission. If you notice the small patch above the fireplace that is an area deliberately preserving the long paint history of this woodwork and will be exposed as a reminder to the later inhabitants of the room. The ‘After’ — the restored surround, paneling and cabinets have been re-installed and are looking great. The off color patch in he middle will be preserved under glass as a reminder of the change this woodworking has seen and for future paint analysis if ever needed again in the future. While there is a LOT of work that remains on the rest of the interior the Wellington House is off to a great start and I hope that the rest of the building will be restored to its earlier glory in the coming years. You can learn more about the Wellington House and some of its history here. 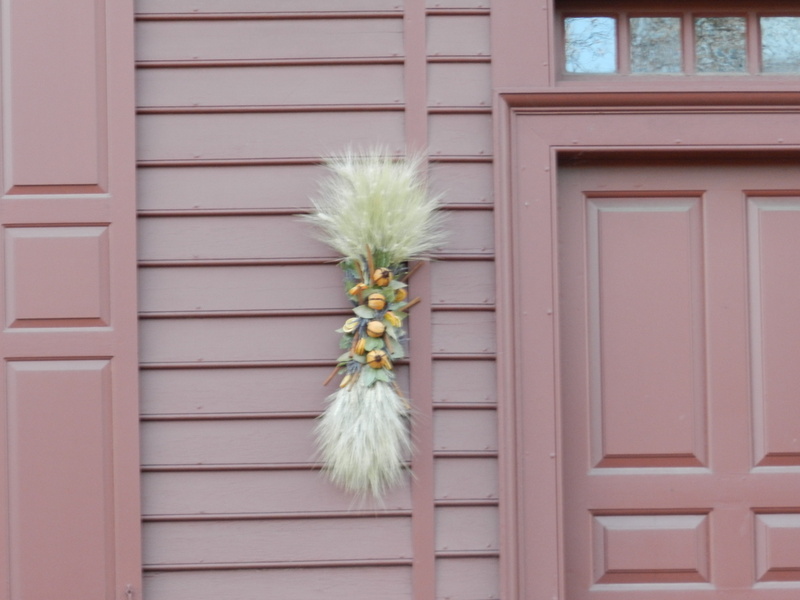 What to do with 56 pounds of horsehair at Montpelier? 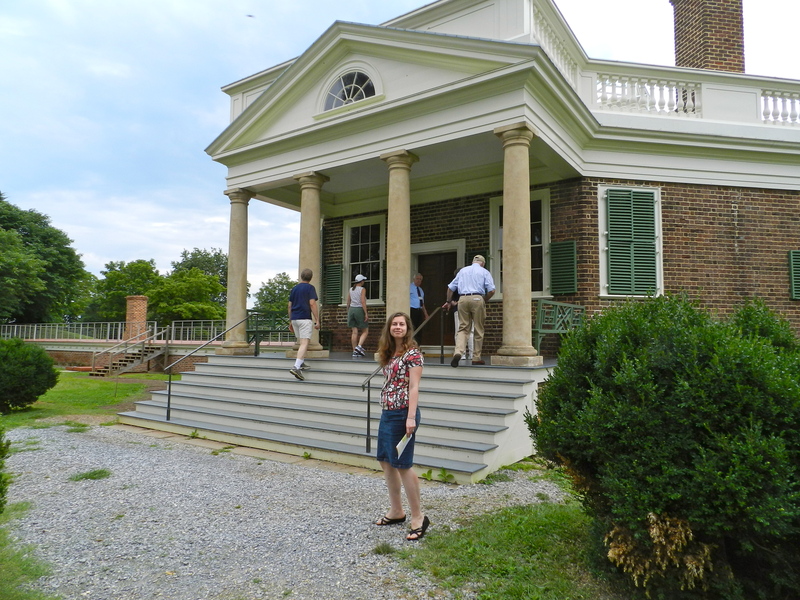 On a recent visit to Washington D.C. my wife and I took a day trip out to Orange VA to see Montpelier — the rural estate of James and Dolley Madison. If you have never been to the home of the 4th U.S. President and ‘father’ of the U.S. Constitution, I highly recommend taking a day to visit especially if you are interested in modern historic preservation. 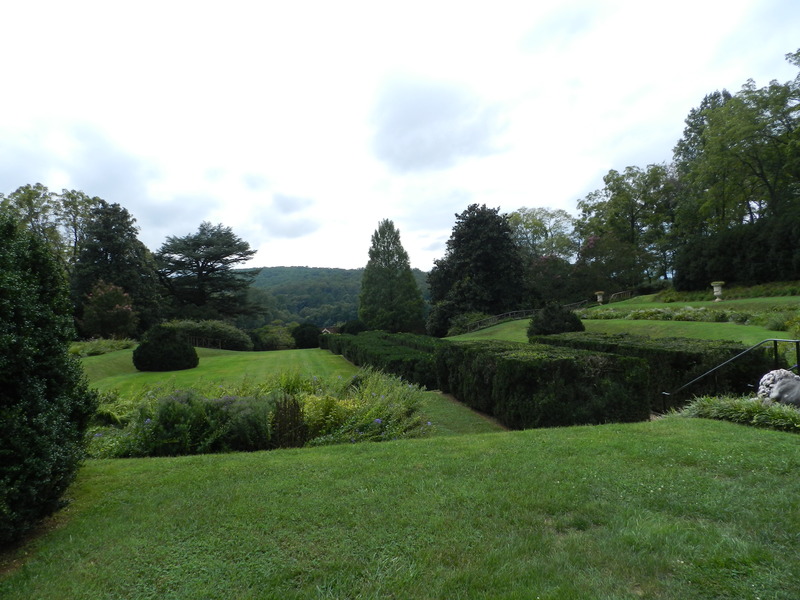 The mansion is situated on ~2700 acres and provides stunning views of the Blue Ridge Mountains and surrounding terrain. Many people have seen Washington’s Mt. 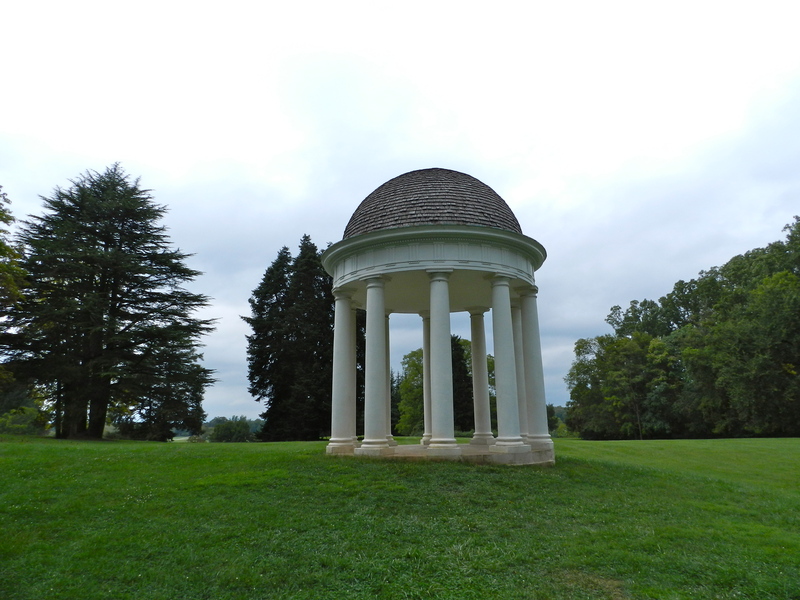 Vernon, Adam’s Peacefield, Jefferson’s Monticello over the years and depending on when and how they were preserved you can see varying degrees of ‘re-muddling’ from generations of caretakers each with their own budgets, skill sets and agendas. In more recent years Historic Preservation efforts have evolved along with related science and technology to try and adhere to more scientific methods and standards which allow for better educated decisions around reading materials, doing research etc — though there are still politics and agendas — my belief is that modern interpretations attempt to be more grounded in findings from the site and related research and more forthcoming with calling out what was done based on fact and what was carried out based on an educated guess — a trend I hope continues as new facts are learned about a site. 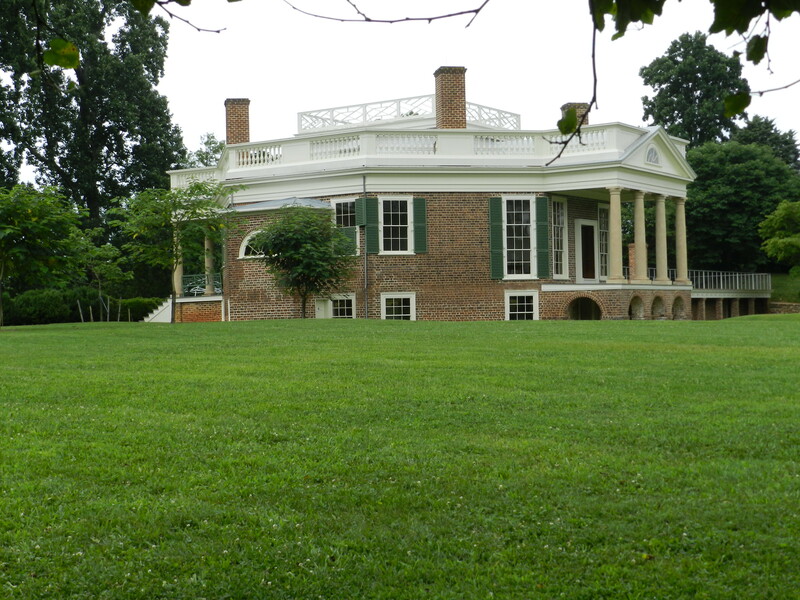 Many people have not seen Montpelier since the the property was a private residence for parts of the DuPont family for much of the 20th century. 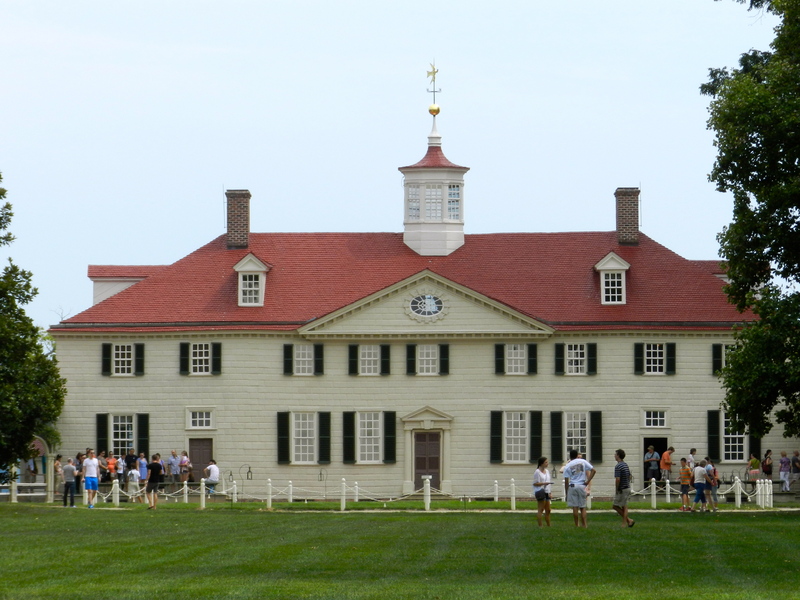 In 1983 the site was bequeathed to the National Trust for Historic Preservation (NTHP) which carried out a $25M major restoration effort from ~2003-2009. 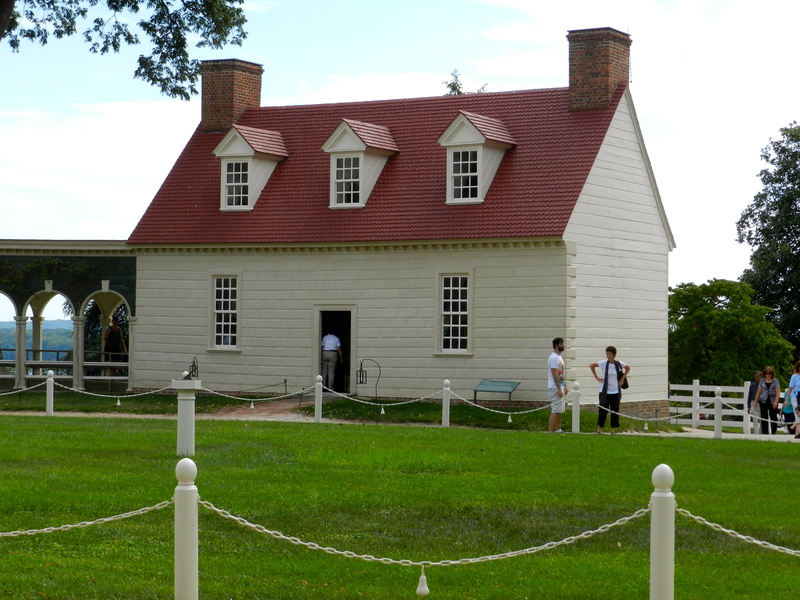 After doing extensive research which called upon many experts in the field of historic preservation — from the National Parks Department, Colonial Williamsburg and private practitioners — the NTHP removed 23,739* square feet of living space from the 20th century additions made by the DuPonts. The goal was to restore the property to what it looked like at the time the Madison’s lived there. 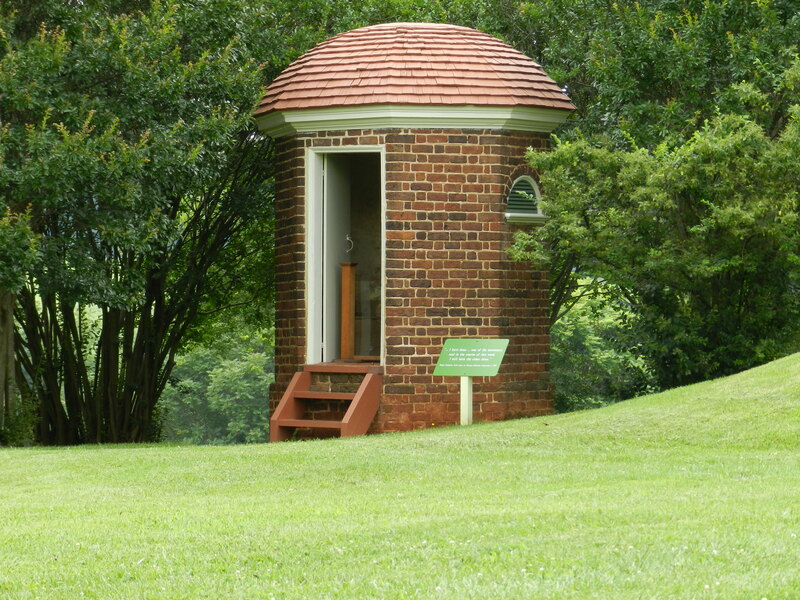 One exterior feature that survived largely intact was Mr. Madison’s temple which sat atop the ice house which was the source of ice for Dolley’s famous ice cream. The exterior work ranged from removing later exterior renovations to stabilizing, preserving, restoring and/or replacing exterior architectural details like the front door surrounds. Other work was based on archeological and documentary evidence of the site — this was the case with the outbuildings which would have serviced the main home and was where the slaves and servants lived and worked. The interior of the mansion also underwent extensive work, unfortunately we are not allowed to take photos inside, so if you want to see it for yourself you will have to visit. What has me so excited about this site compared to many others is the fact that is was largely preserved — even with all the later renovations and additions the core of the house and many of its doors, windows and mantels survived on site AND the preservation and restoration work mainly happened during the last ten years with the benefit of being carried out by some of the best practitioners in the field. The restored mansion takes on the look and feel of many of the historic buildings I often work on — you can see and smell the fresh plaster, the rooms are sparsely furnished as the Foundation is still looking to acquire some of the original furnishings — you can see active preservation projects going on at the site — it feels more alive and tangible compared to some of the similar sites which feel more dusty and tired from a constant stream of visitors. So why would I ever need 56 pounds of horsehair at Montpelier? To mix into 90 tons of dry mix plaster* of course! That is how much plaster it took to restore the interior of the mansion. 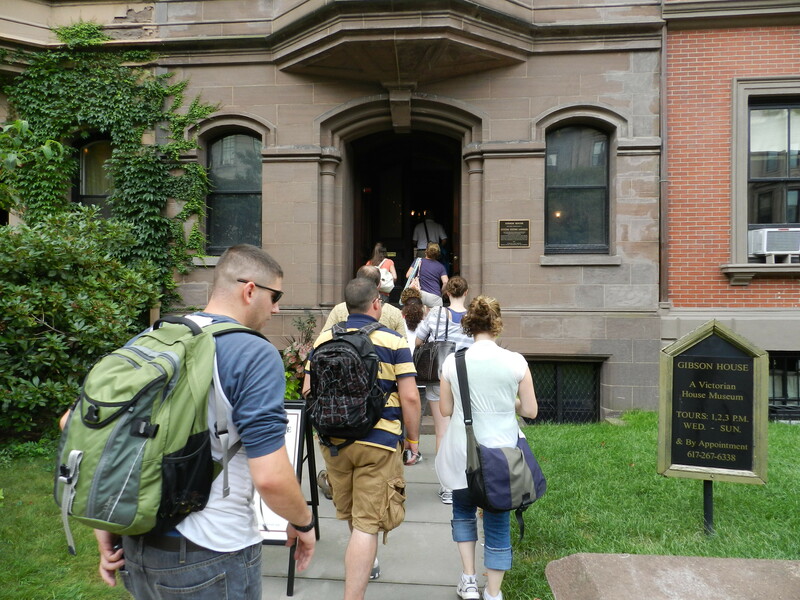 Staggering figures and interesting facts will keep your inner preservation carpenter happy as you take the tour. 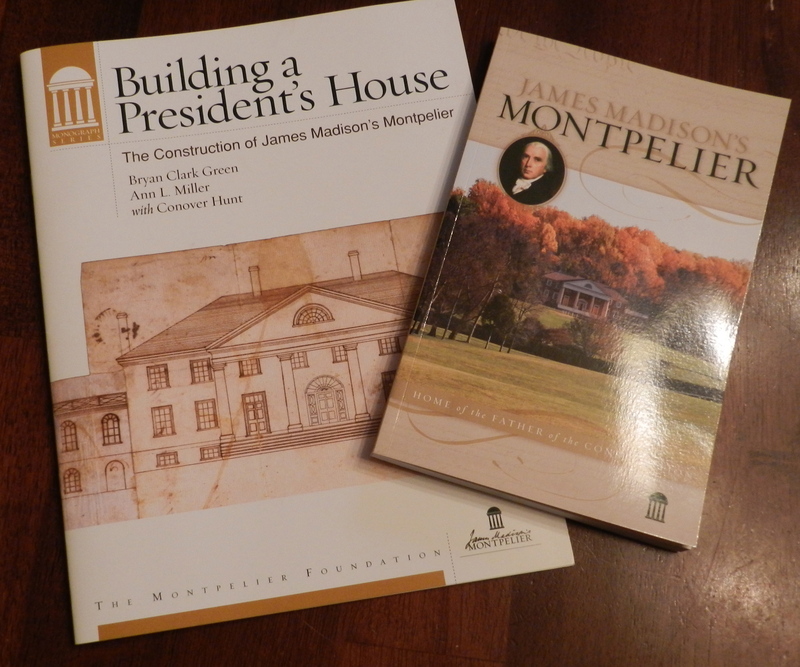 The foundation offers many books in the gift shop about the Madison’s and other founding fathers but below are two of my favorites as they are also used to train some of the docents. I recommend picking them up if you go there. They walk you through the history of the site and its inhabitants, documentation of the restoration and related research. 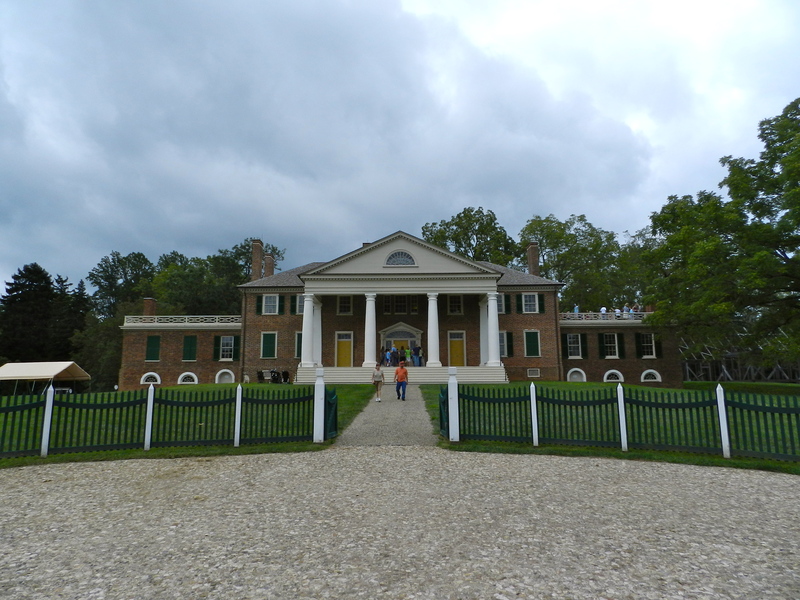 If you are interested to learn more about the restoration of Montpelier check out the official website here. And for the gardener in your life — the history of the various gardens and landscapes can be found on this site. 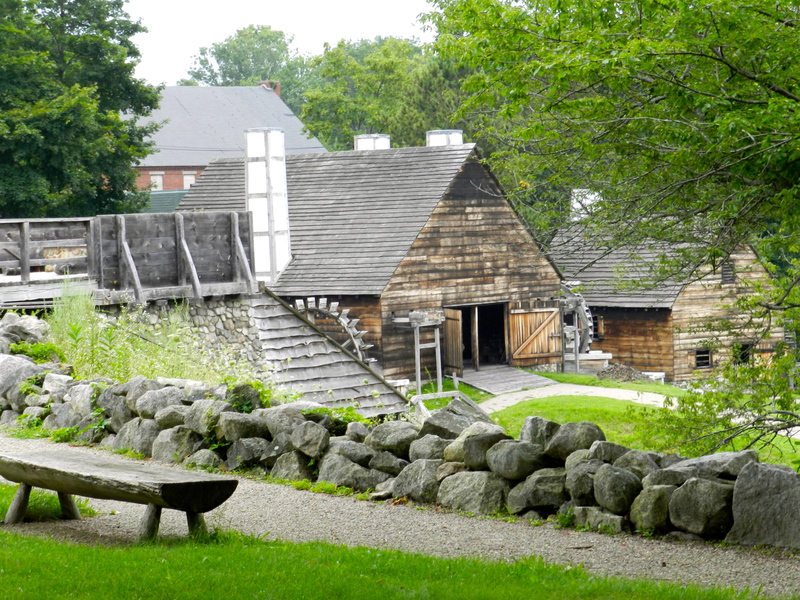 If you are interested in visiting Montpelier, check out their calendar of activities on the main Montpelier website here. 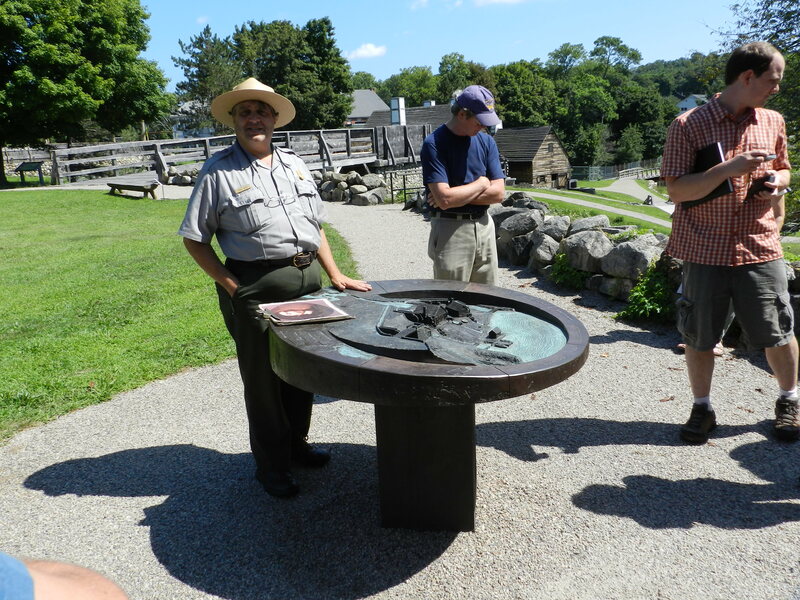 There are lots of events throughout the year including candle light tours, and tours going more in depth on the Madison’s, Archeology, Historic Preservation, and the life and times of inhabitants of that period in American history. I hope to see you there. * Above facts were taken from ‘James Madison’s Sovenir Book’ UPC 190001 and available from the gift shop at Montpelier. Why would someone want to turn wood into stone? A stone building or home often conveyed a sense of lasting presence, wealth, and a connection to the many famous stone structures of antiquity that we so often try to emulate and incorporate into our architectural designs. So why not just build with stone in the first place? The answer is usually economics — wood is a lot cheaper, easier to move and shape compared to stone — so if you could make your wooden home look like stone you’ll be keeping up with the Jones’ and not break the bank. 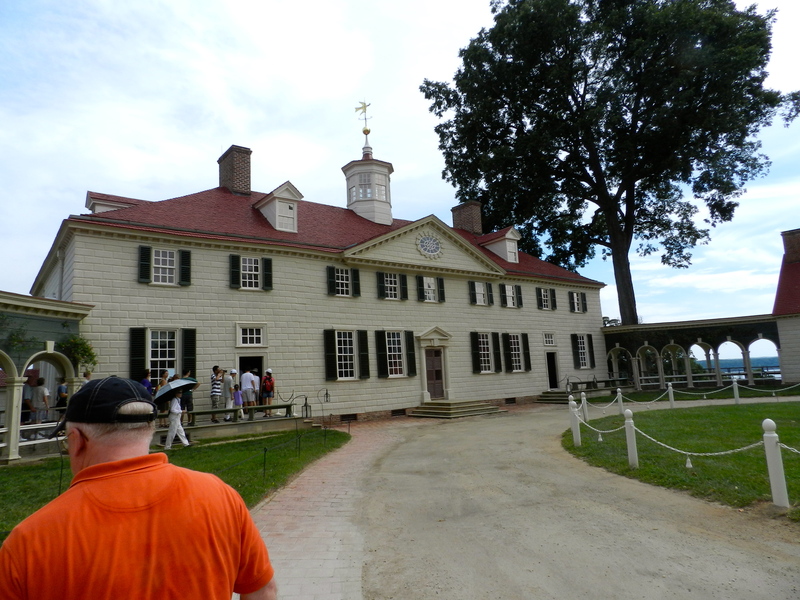 I just returned from a trip down to Washington D.C. where we also visited Mount Vernon — the home of George and Martha Washington with amazing views of the Potomac — and the most famous example of Feigned Rustication I am aware of. 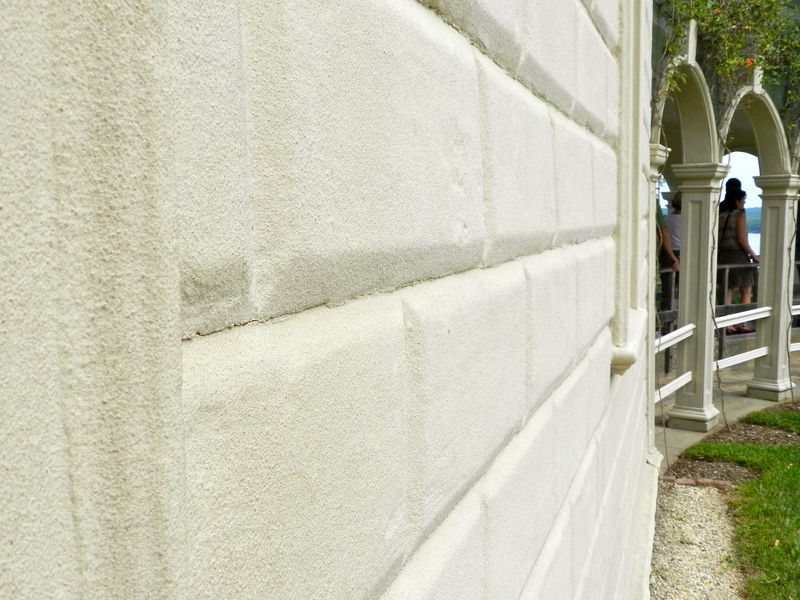 Rustication is a term from the world of Masonry wherein the individual stones are squared off or beveled so as to accentuate the textured edges of each block. You can learn more about it on Wikipedia here. You can often see this feature on the lower and/or first levels of large masonry structures like banks and older stone office buildings. It provided a sense of grounding and provided a stark contrast to the smoother ashlar work on upper stories. 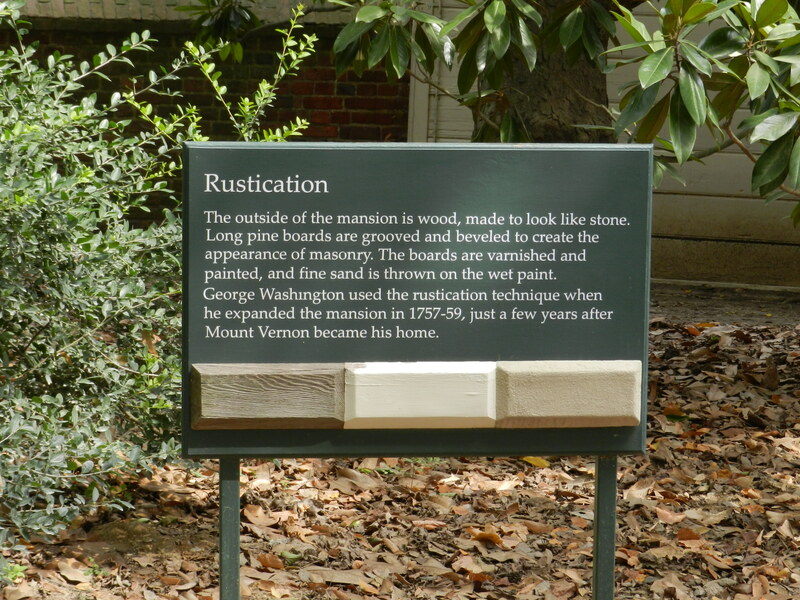 Feigned Rustication is the process of taking wood siding — carving/shaping it so that it looks like a series of rusticated stones, priming and painting it, and then when the paint is still wet covering it with fine sand so that the board takes on the color/shape/texture of stone. While not alchemy, this technique got the job done and from a distance it’s hard to tell the building is not made from stone until you get up close — and even then you have to know what you are looking at. So while George and Martha Washington were generally quite wealthy during their time, they did make decisions that weighed materials vs. appearance vs. cost much the same way we do in our own homes today and stretched the dollar as much as they could. As you can see in the picture below, for secondary buildings they only applied this technique to the fronts of the buildings — around the corner you can see the siding reverts back to a nice beaded clapboard detail. 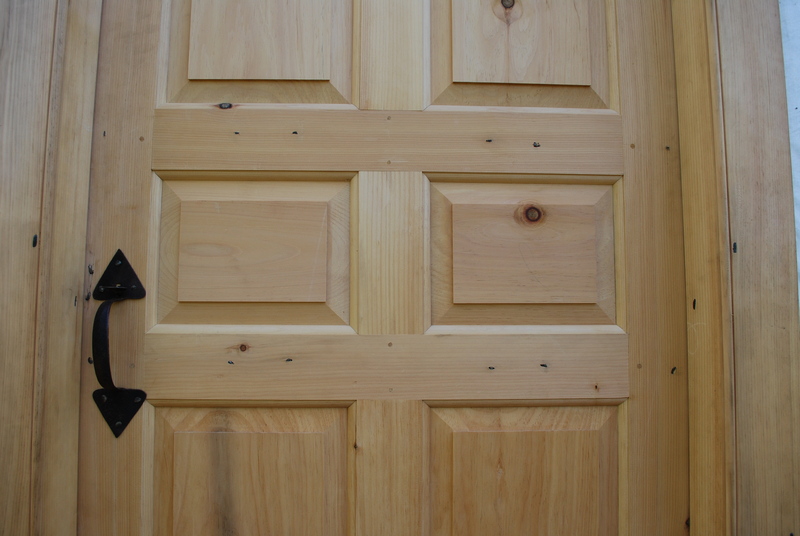 You can also see some other more common faux finishes like artificial grain applied to some doors in the home — to make them look like expensive mahogany. This was a fairly common practice and not looked down upon the way some readers may be interpreting this. 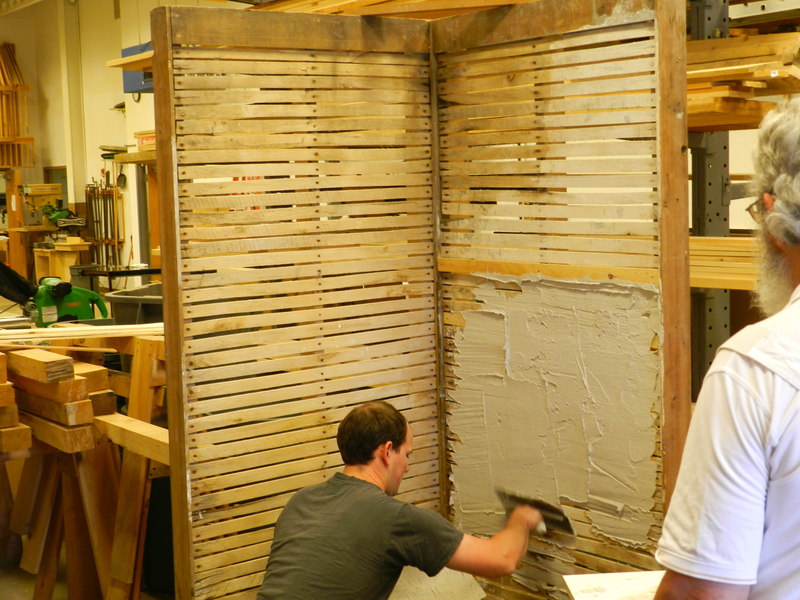 Now that you’ve seen how we can transform wood into stone — were you fooled by the illusion? 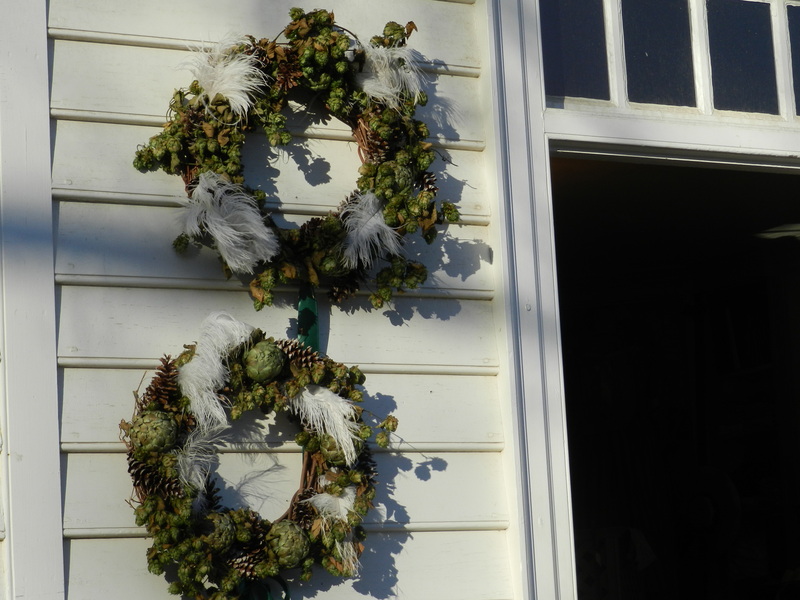 Are you going to work some similar alchemy on your own home’s exterior? 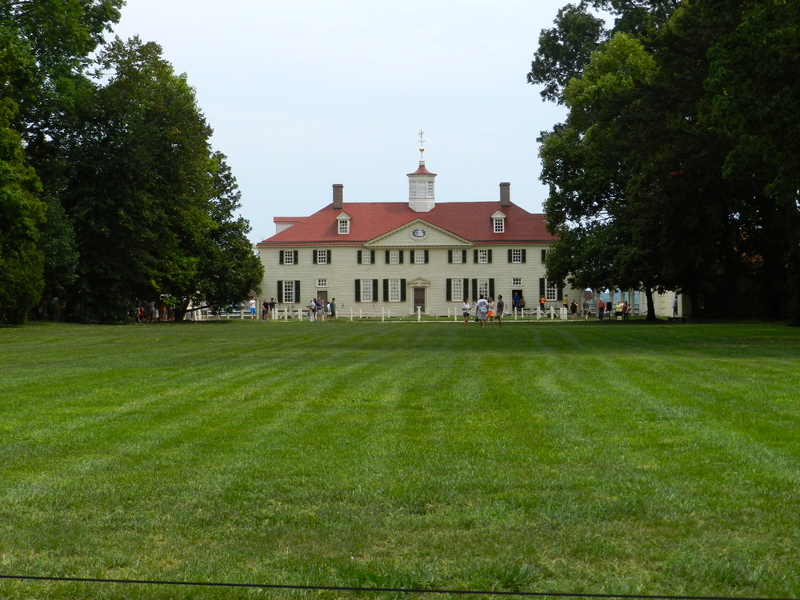 I highly recommend visiting Mount Vernon if you are in the Northern VA/Washington D.C. Area. You can find out more about this historic home, museum and grounds here. What did you do for summer vacation? A Decathlon in Historic Preservation?! Back in grade school, I enjoyed when students would get up in front of the class and talk about what they did for their summer vacation. 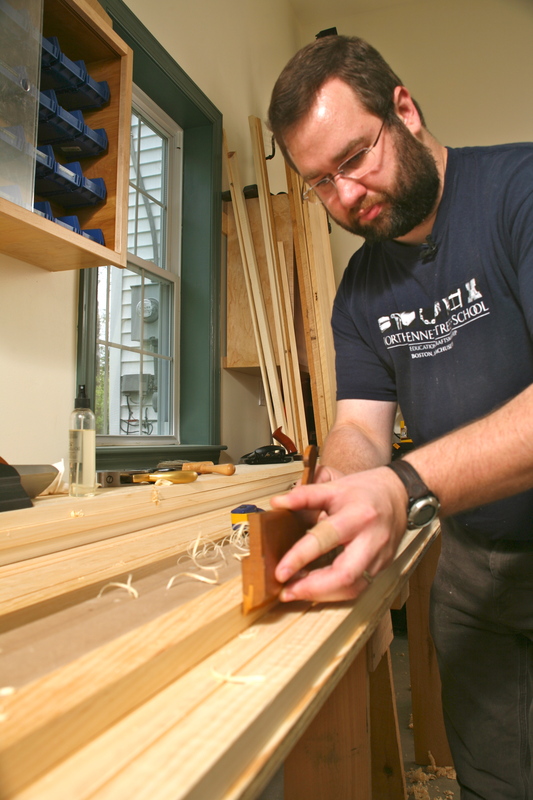 This summer rather than taking a rest from a very recent move to New Hampshire and new job earlier in the year I decided to spend it pursuing my passion for teaching traditional craft skills. 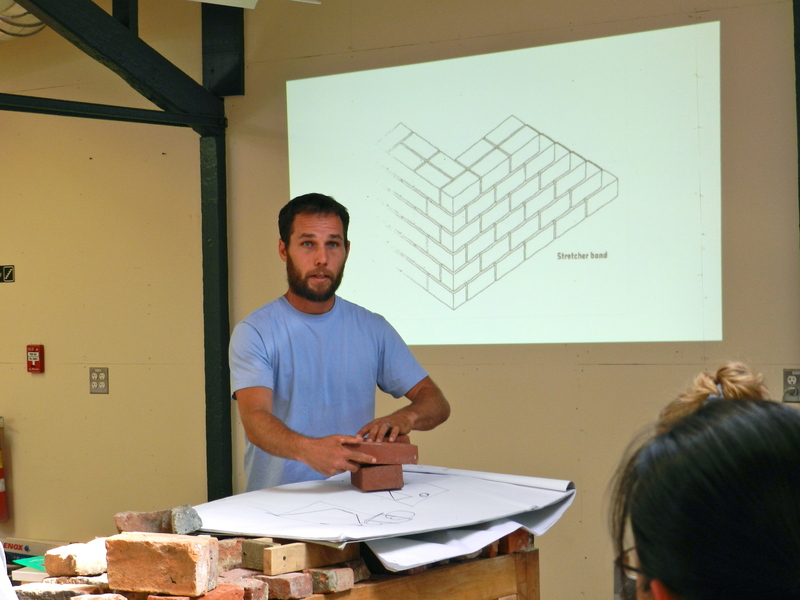 I’ve been teaching the ‘Traditional Building’ master’s class at the Boston Architectural College (BAC) in partnership with the North Bennet Street School (NBSS). 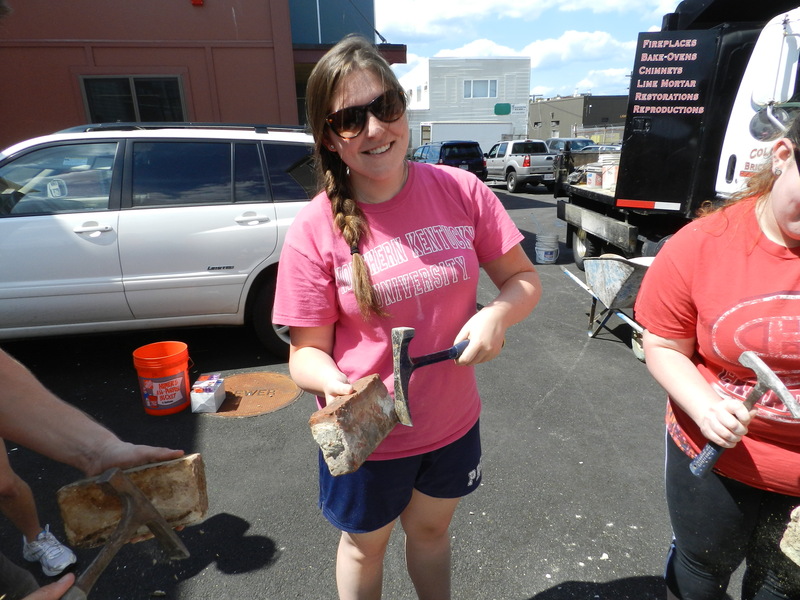 It’s a low residency master’s program in Historic Preservation wherein students come in from around the country for a very intensive hands on week in Boston and spend the rest of the semester working online. 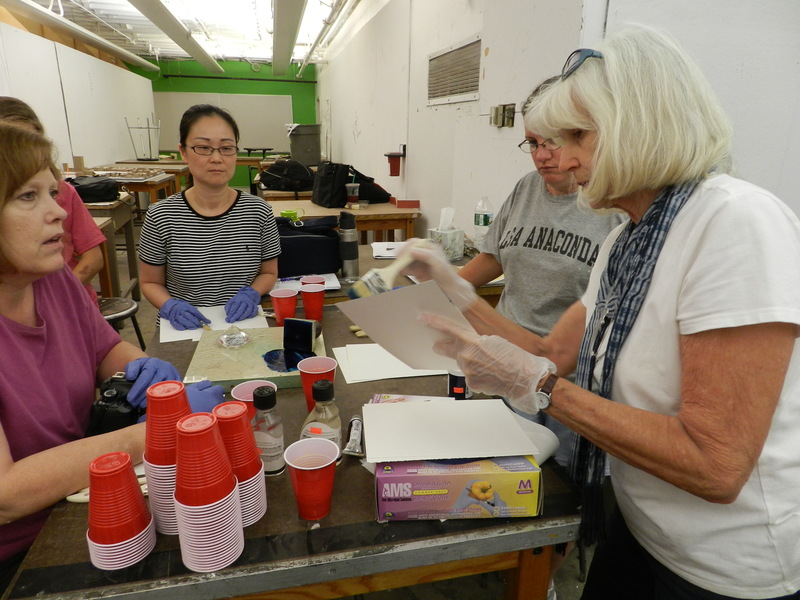 For 8 straight days the students are with me from the early morning until dinner time, they grab a quick bite to eat and spend their evenings completing the intensive portion of their other class this semester ‘Preservation Philosophy and Practice’ with Virginia ‘Ginny’ Adams. 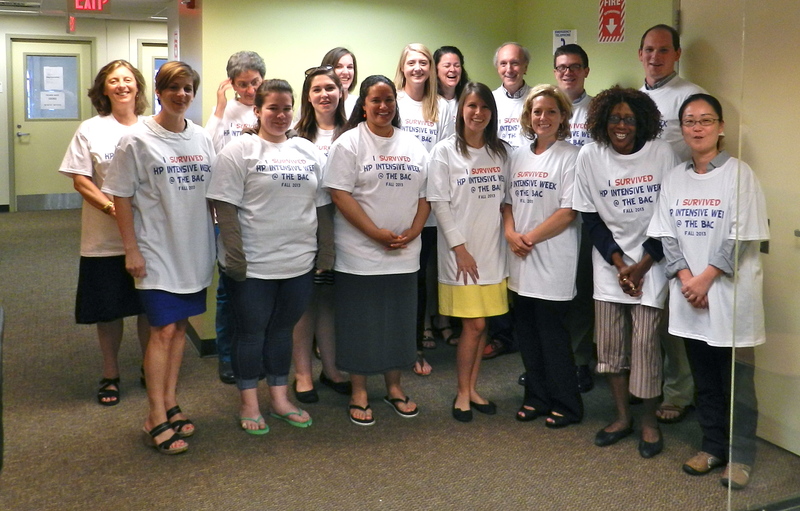 To commemorate the experience Robert Ogle, MDS Director at the BAC had the shirts below made up for the class which will be a new tradition for this program. I’m happy to report that everyone survived the week. Once the intensive was over, everyone took a quick breath, headed home and have been busy with their cameras and notebooks applying some of the skills they learned to their own work and later assignments in the class ever since. All in all it was a great way to spend a summer vacation. 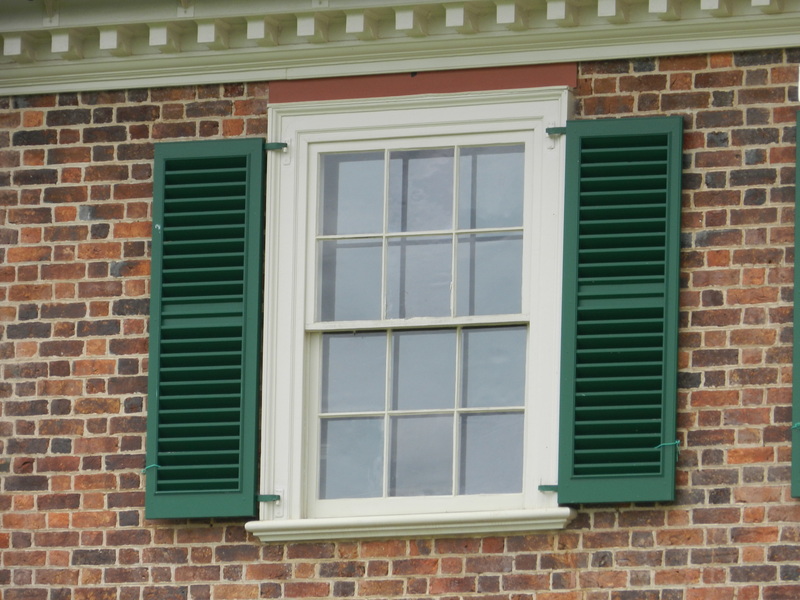 In many posts we’ve talked about why old windows are worth saving and how to build or restore sash for them, but not much on what it would take to build a new window complete with jamb and trim and install it. 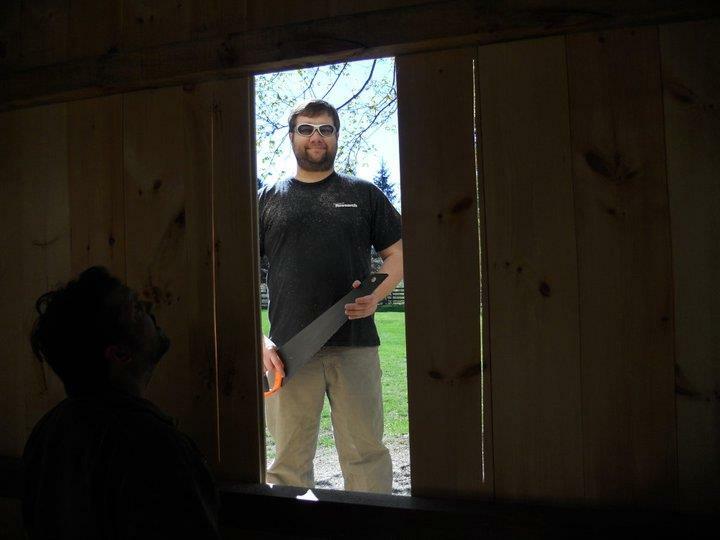 A while back I had just such an opportunity when working on the timber framed barn workshop of my friend Rich. Much of the work for these windows took place in the shop — building traditional single hung (one moving sash) true divided light windows. A hand built window can offer a VERY long service life, be easily repaired and often look much better than anything you can buy commercially. The ability to build a new jamb to go along with your sashes will allow you to really fine tune the movement of the windows, the exact choice of hardware — if any and allow you to create a distinctive look for your home. Bill cutting through the wall to install my window. Once the shop work was completed, the jamb is complete, the sash are fitted, glazed and the paint has dried it was time to install the completed window unit into the barn. When working on a timber framed barn you’ll want to make sure you’ve carefully laid out where you want the windows to go — you generally do not want your window obstructed by braces or other framing members. You’ll also want to make sure that you have added in sufficient nailers and/or studs so that your window can be firmly attached to the building. 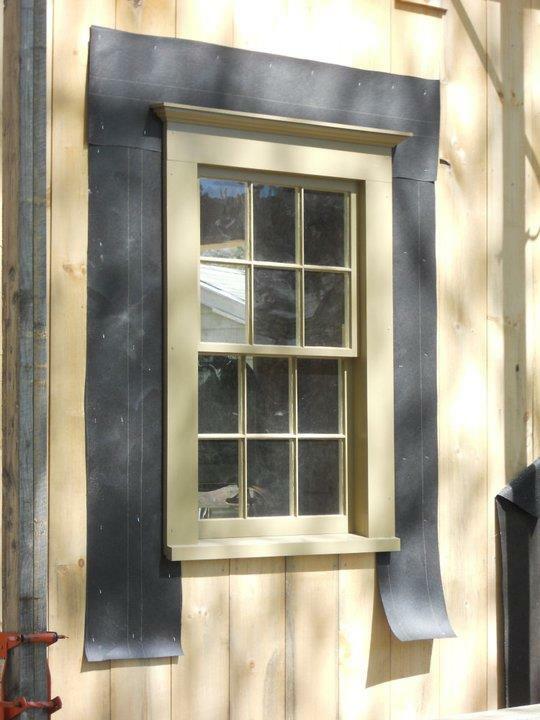 These hand built windows, complete with jamb, sills, casing and leaded flashing install much the same way you would install an Anderson or Pella new construction drop in window. You’ll want to take the same time and effort to level the window, add insulation if needed, and flash out the window. Once installed you can trim out the interior of the window to blend with the interior surfaces. 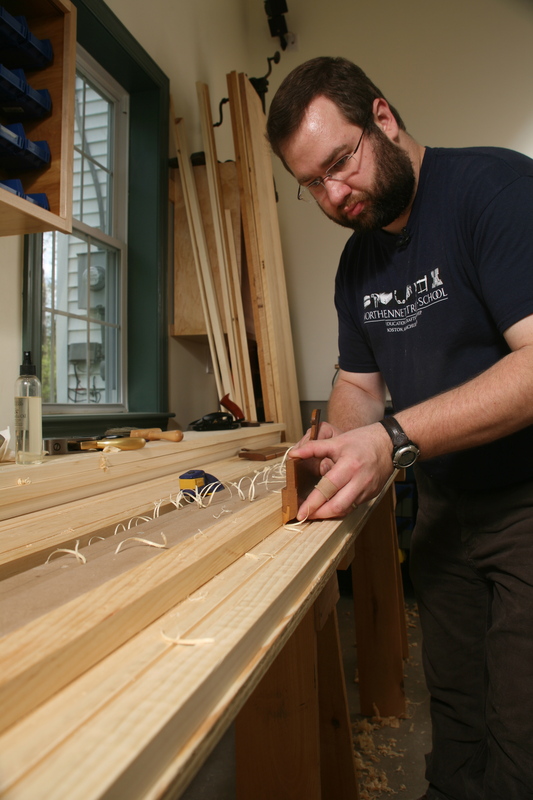 If you’ve invested the time to learn how to build a traditional window sash, building an entire window as described here can be a very enjoyable and rewarding experience — plus with these new found skills you can go off and build a window of any size and shape. 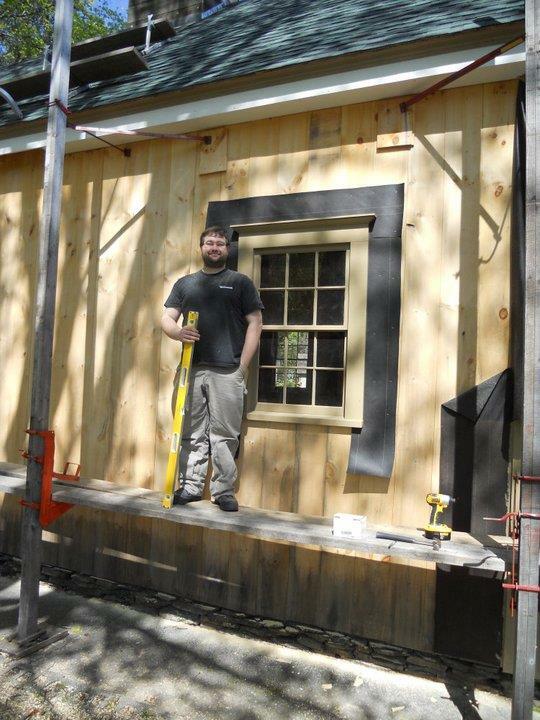 Below is a quick slideshow of the above windows being installed into a timber framed barn.